Reeseville, Wis., Jan. 29—With one of the worst blizzards in the history of the village raging and the wind blowing a gale, almost the entire business section of Reeseville was destroyed by fire today. But for the prompt assistance rendered by the cities called upon for aid it is certain that the entire town would be one mass of ruins tonight. As it is, eight business blocks and one dwelling are gone, the estimated loss being $25,000. The fire started this noon, following a gasoline explosion in the hardware store of C. W. Steinacher. The volunteer fire department was on the ground within a short time, but the flames had made considerable headway and efforts to protect surrounding property proved fruitless with the storm fanning the blaze. Surrounding towns were appealed to for aid by telephone and telegraph and Milwaukee Road at once placed special trains in readiness at Columbus and at Watertown to carry apparatus to the stricken village. In the meantime the department from Lowell, a village about three miles distant, had reached here overland. Within a short time a hook and ladder company with apparatus reached here from Columbus and an engine with a full crew complement came from Watertown. Thus strengthened, the local department renewed its fight against the spreading conflagration, but it was not until after 6 o'clock tonight that the fire was under control. Among the buildings destroyed or damaged practically beyond repair are a meat market, two saloons, a blacksmith shop, and the State Bank of Reeseville. When danger of further spread of the conflagration was passed the departments from Columbus and Watertown returned home by special trains. The fire was caused by an explosion in the store of C. W. Steinacher; Arthur Cohn, a clerk, was drawing gasoline from a tank, when the gases from the gasoline were exploded by a nearby light. His face and hands were seriously burned, and he has since been receiving treatment at St. Mary's Hospital, this city. The Silsby engine and the east side hose wagon on appeal for help were sent from here with a sufficient number of firemen to man them. Fire Chief Carl Otto had one of his feet badly cut at the ankle while assisting fighting the fire. Among buildings to be erected here during the summer are a two story double building by the Kurth Company on the site of the old opera house at a cost of $10,000; a single two story building costing $5,000, by William Hartig Company, a new home for the state bank and residences by O. A. Sell, Miss Bertha Yauman, W. E. Wendt and Dr. Eickelberg. Thus is Reeseville rising like a phoenix from the ashes of the fire which recently destroyed the greater part of the town. The Reeseville Review says that the business men of Reeseville made an agreement to take all the available space in that paper for advertising purposes. All of which shows that the Reeseville merchants are wide awake and up-to-date. They have sharp competition from the larger cities, particularly Watertown and Milwaukee, both of which places are easily reached by fast trains, running only a few hours apart. In order to meet this competition, the Reeseville merchants have stocked up with the best goods in the market, which they freely advertise in the home paper and thereby increase the local trade.—Juneau Telephone. Two men entered the store of D. W. Schwab & Co., on last Monday night, disrobed themselves, and redressed in a new outfit, leaving their old garbs after them. Messrs. Schwab and Co's loss is about $20. "Dave" Schwab, the old stand-by clothing man of Watertown, was in Juneau Monday. This was "Dave’s" last business trip to that city, as he is soon to leave for Cincinnati where he intends to locate permanently. For thirty-seven years the well-known clothing firm of D. Schwab & Co., of Watertown, has been a household word among lovers of fine clothing, and has always been synonymous with good material, good work and good fit. For thirteen years "Dave" has been the responsible head of the establishment and there is no businessman of our acquaintance outside of our own city, who will be more thoroughly missed than he. A regular solicitor for the best grades of Gents' Furnishing Goods, his old time patrons as well as his new ones will scarcely feel that perfect confidence in other firms that they have in his. But successor Mr. Andrew Hertel has been a trusty and trusted employee of the firm for years, and probably understands the tastes and demands of this section nearly as well as Mr. Schwab himself, while the veteran cutter, A. W. Cavanath [John Cavanaugh], will still handle the shears, and in the future, as in the past, will "give the people perfect fit. He was square in business, a genial good fellow to associate with, could tell a rousing story, and was everybody's friend. We join with hosts of others in wishing him “God speed” wherever he may be. A prominent 4th ward young lady had a lively encounter with a billy goat on last Tuesday afternoon to the great amusement of the spectators. Said young lady was amusing herself by mimicking the goat's bleat, when "Billy" retaliated by chasing and bunting her. Not every Belle enjoys an encounter with a billy goat, but "Billy" enjoyed himself hugely on this occasion at the expense of the young lady. It is safe to say that billy goats are not her pet animals. A large audience assembled last Thursday evening to hear the lecture on Charlemagne. The use of Concordia Opera House has been generously donated, as the capacity of the assembly room was altogether insufficient. The hall, however, was poorly heated to the discomfort of many, and the bowling was also the source of some annoyance. The next lecture takes place Thursday, Nov. 19, the subject being Lorenzo di Medici. The section of South Third Street that had been closed since August reopened to traffic on December 3rd. The $1.47 million reconstruction project included South Third Street from East Main Street to Western Avenue and five roadways in that area between Third and Fourth streets. Those roads include Market Street, Jefferson Street, Dodge Street, Spring Street and Wisconsin Street. South Third Street from Main Street to Dodge Street now includes two 11 -foot lanes and the parking area on both sides of the road was widened from seven feet to 10 feet. South Third Street from Dodge Street to Western Avenue has two 11 -foot lanes and the 8-foot parking area on the west side of the road was expanded to 10 feet. New sidewalks, stamped concrete and decorative lighting was installed from Main Street to Dodge Street. The sidewalks on Third Street from Dodge Street to Western Avenue, as well as the five side roads, were replaced where necessary. Watertown's new deputy city clerk, Mrs. Ralph O. Ertl of 1311 River Drive, will begin her duties at the City Hall next Monday morning. She succeeds the late Mrs. Lester A. Kuckkahn whose sudden death took place on Nov. 8, just one month to the date on which her successor will begin her duties. Mrs. Ertl has worked in the office of the Sears Roebuck Co. store here for some years. She has had some experience in City Hall office work, having worked there for a time after the death of Arthur W. Duffy, who served as city clerk. The Volunteer of the Year award winner was announced and three new officers were installed at the annual Watertown Memorial Hospital Auxiliary tea held Sunday in the hospital cafeteria. Members of the auxiliary voted Diane Cochrane as Volunteer of the Year. She has served on the hospital auxiliary board for five years in several capacities including publicity chairman, legislation chairman and vice president of fund raising. A child safe volunteer at the hospital, she was also chairman of the hospital Christmas bazaar held this year. New officers installed for two-year terms were Jo Bostrom, vice president of programs; Marion Bauman, newsletter chairman and corresponding secretary; and Peg Brandenstein, membership chairman and assistant treasurer. They were installed by Sharyn Abraham, a past president of the auxiliary. The Catholic Woman's Club was given the opportunity Monday evening of listening to a very entertaining illustrated lecture on "Foreign Cathedrals," given by Mr. and Mrs. E. J. Brandt. The paper read by Mr. Brandt was very comprehensive in its scope, showed much care in its preparation, and contained much interesting information about many of the wonderful cathedrals as well as other places of interest visited by Mr. and Mrs. Brandt on their recent European trip. Beginning with the churches of England, Mr. Brandt described the famous Westminster Abbey, as being typical of England's finest attempt in church architecture, going on from there with a description of the most beautiful and best known churches in various countries visited—Norway, Belgium, Switzerland, France and Germany—and concluding with many beautiful exterior and interior views of four of Italy's greatest cathedrals— Santa Maria Novelle, in Florence; the Cathedral of Milan St. Marks, in Venice; and St. Peters, in Rome. In speaking of St. Peter's, Mr. Brandt said that some idea of its vastness could be obtained if we considered it as being just twice as high as the spire of St. Bernard's Church. In all, over two hundred views were thrown on the screen, giving the audience an excellent idea not only of the general appearance of these famous edifices of the old world, but also showing many fine details such as artistically-carved pulpits, doors of exquisite design and altars of rare beauty. The many rare and beautiful churches erected in Europe many centuries ago will . . .
Members of the City Council and the City Water Commission last night laid the groundwork for carrying out the first in a series of steps to improve and expand the city's water facilities, based on a report filed several months ago by the Jerry Donahue Engineering Co. of Sheboygan. The initial step, as decided tentatively last night, calls for repairing and reconditioning Well No. 1 of the system. It was decided to bring in a report and resolution to this effect at the Dec. 16 meeting of the Council. Any work undertaken will be submitted on bids. Sally Flegner, R.N., has been appointed department head of the Newbirth Center at Watertown Memorial Hospital. Flegner, a native of Appleton, has worked as a registered nurse at Watertown Memorial for eight and one-half years, the last seven and one-half in obstetrics. She has served as a vice president of Webster Elementary School's P.T.A., assisted with library and church functions, been a substitute Sunday school teacher, and is currently room mother for second grade and kindergarten at Webster. Welcome Inn, 700 East Main Street, has been sold to a local partnership and is under new ownership. Balloon Enterprises, a partnership consisting of Charles Balistreri, William O'Brien, and David Nielsen, has been formed, and has purchased the hotel and restaurant facilities. Balistreri and his wife, Betty, who formerly managed Balistreri's Ristorante at 100 Madison Street, will manage the motel and restaurant businesses. They are also planning to move into the apartment which is part of the hotel. A railroad engine spilled more than 2,000 gallons of diesel fuel near a wetlands area in Watertown on Tuesday morning, after it derailed while traveling on tracks south of West Main Street, the Watertown fire chief said. Chief Richard Olson said the train, owned by CP Rail, did not tip over but the track tilted enough to derail the engine and puncture its fuel tank in two places. “There were 2,100 gallons lost of diesel fuel, which is a very major spill,” Olson said. Carl Schurz, politician and career hunter by profession, died May 14th. He was met at the gate of Hell by the secretary of that institution with the following question, "Were you not one of the enthusiasts for the battle of freedom, in your young days? If the reports of my men are correct—and I am confident my men are more reliable than the majority of the newspaper men on your planet—you were even a Revolutionist? "And why have you thrown your ideals and convictions overboard?" "There was no money in them," Carl replied, sulkily. The Satanic Secretary nodded to one of his stokers, saying, "Add 5,000 tons of hard coal to our fires. Here we have a man that sold his soul for money. He deserves to roast a thousand times more than the ordinary sinner." Robert Lee Grulke, age 79, of Menasha, passed away into the arms of God during the early hours of Tuesday, November 11, 2008, at St. Elizabeth's Hospital. He was born in Lebanon, WI, on February 17, 1929, to Emil and Charlotte (Andrews) Grulke and was one of 10 children. He graduated from Watertown High School and later attended Northwest College and the University of WI, Milwaukee, obtaining a Masters degree in Education. He went on to marry Elaine Wentland of Deerfield, WI at St. John's Lutheran Church in Dubuque, IA on March 1, 1959. They then moved to Lincoln, Nebraska where they had three children and then later moved to Menasha, WI where they currently still reside. At a young age, Bob showed promise as one of Dodge Counties "Wiz Kids." He also went on to receive the Joe Davies scholarship award for select high school students in and around Watertown. Upon completion of high school, Bob wrote the highest biology college admissions scores of that time. After graduating from college, at the age of 18, Bob became a teacher and principal in Waukesha County, WI earning the prestigious placement of one of the top three principals in the State of WI. During his tenure as a principal he also co-authored a book, "Guide to Superintendency for School Administrators in Waukesha County." Upon retirement from the school system, he went on to work for the leading educational publisher, Prentice Hall, becoming one of the top three sales people in the company. Bob was an avid hunter and fisherman and it was often said that he was most happy fishing for bluegills with his fly rod. He also loved gardening, photography, and all animals and birds in general. Hardly ever seen without his dogs, we know that they will all be happy to greet him again. Bob is survived by his beloved wife of almost 50 years, Elaine Grulke and dear father to their three children: Forrest (Rebecca) Grulke, Plover, WI; Nancy Wissell, Vernon Hills, IL; and Tracy (Dan) Curtin, Hortonville, WI; seven grandchildren: Krystyna, Bryttany, Barrett, Hayden, Mackenzie, Alexis, and Madison. Surviving siblings and in-laws: Emil Jr. (Betty), Marvin, Cheryl (Harry) Haapala, Stuart, Kathy (Ron) Schuman, William Jordan, and Margo Grulke. He was preceded in death by his parents and siblings: Emil and Charlotte Grulke; Barbara Jordan, George Grulke, Phyllis McCuen, and Joanne Kreitzer. A celebration of Bob's life will we held on Thursday, November 13, from 4 p.m. - 8 p.m. at the Wichmann Funeral Home Tri-County Chapel (3212 S Oneida Street, Menasha). Church services will take place on Friday, November 14, 2008, at 11:30 a.m. at Immanuel Lutheran Church in Lebanon, Wisconsin and a visitation will be available Friday morning from 10 a.m. until the time of service at the church. Bob will also be receiving graveside military rights for his work in the Naval Reserves. Interment will take place in the Kroughville Lutheran Moravian Cemetery in Lake Mills, Wisconsin. In lieu of flowers, donations are appreciated to the Fox Valley Humane Association. Albert W. Bruesehoff, of 708 North 15th Street, Sheboygan, passed away on November 10th, at St. Nicholas Hospital, at the age of 89. Albert was born on May 21, 1919, at Barre Mills, WI, the son of Richard and Blondina (Freitag) Bruesehoff. He was baptized at the Lutheran church in Barre Mills where his father served as teacher and organist. He attended Lutheran schools in Racine and Juneau. He attended high school at Northwestern Preparatory School in Watertown, WI. At that time, his parents moved to Watertown where his father took the position of principal of the school at Bethesda Lutheran Home. He graduated from Dr. Martin Luther College, New Ulm, MN, in 1945. His graduate work was done at the University of Wisconsin, Madison, as well as Marquette University, the University of Minnesota, Mankato, and the University of Minnesota, Minneapolis. On June 23, 1946, he was united in marriage to Valeria Thalmann at Emanuel Lutheran Church, Hamburg, MN. Their marriage was blessed with 2 sons and 2 daughters. The family lived in Winona, MN, Elgin, MN, St. Paul, MN, Jacksonville, IL, and Oconomowoc, WI, where Albert was teacher and principal of the Lutheran schools. His last position was as Director of Education and Minister of Music at St. Mark Lutheran Church in Sheboygan, retiring in 1978. In 2005 he was recognized by the Lutheran Church, Missouri Synod, for 60 years of faithful service in the ministry of the church. Albert was a member of Trinity Lutheran Church, the Sheboygan Chapter of People to People, the Mayor's International Committee, the Commission on Aging, the Historical Preservation Committee, the Wisconsin Council on Human Concern, the Northeast Area Health Board, the United Way Board and the Sheboygan Symphony Orchestra. In 1995 his name was placed on the Sheboygan Musical Wall of Fame. Survivors include his wife, Valeria; two sons, the Rev. Richard (Naomi) Bruesehoff, Park Ridge, IL; the Rev. Mark (Diane) Bruesehoff, Ocean City, NJ; two daughters, Judith (Jon) Koenig, Michigan City, IN; and Kristin (Robert) Sturgeon, Portage, IN; 10 grandchildren, Nathan Bruesehoff, Renton, WA; Dr. Peter Bruesehoff, Madison, WI; the Rev. Christopher (Jamie) Bruesehoff, Tom's River, NJ; Emily (Michael) Johnson, Kyle, TX; Sara Bruesehoff, Ocean City, NJ; Gretchen Bruesehoff, Elon, NC; Joshua Koenig, Kalamazoo, MI; Jason Koenig, Edwardsville, IL; Erik Sturgeon and Lauren Sturgeon, Portage, IN; two great-grandsons; one sister-in-law and brother-in-law, Leila and Rudy Skoda, Union City, TN; one niece; two nephews; and many cousins and friends. He was preceded in death by his parents, his in-laws, one sister and brother-in-law. Funeral services will be held on November 13 at 12:00 noon at Trinity Lutheran Church, with the Rev. Timothy Mech and the Rev. John Berg officiating. Inurnment will be at Glenview Memorial Gardens, Ixonia, WI. Friends may call at the church from 10:00 a.m.-12:00 noon. In lieu of flowers, memorials may be given to Sheboygan Area Lutheran High School, Bethesda Lutheran Home, Sheboygan Symphony Orchestra or St. Nicholas Hospital Hospice. Another Watertown industry has undertaken an ambitious expansion program. Wis-Pak, Inc., 860 West Street, has announced it is constructing a 48,000 square foot addition to the north end of its facilities. The addition, which will be 200 by 240 feet in size, will be used primarily for warehouse space, according to Arnold Fobes, vice president and general manager. Work on the $600,000 square foot addition got under way this week. Oliver Construction of Oconomowoc is general contractor for the project. Initial ground preparation work is now under way. Six returning letter winners and an influx of talented freshmen promise to make it an interesting season for the Watertown High School swim team. As is the case with the letter winners, the new crop of AAU swimmers is very versatile, giving coach Dave Hanssen a lot of flexibility in the lineup. Hanssen is hoping the incoming group will complement returning letter winners Chris Opperud, Cara Himrich, Ellen Schmitt, Patti Ebert, Cathie Miller and Lisa Drebenstedt. The new Milwaukee Street bridge over the Rock River reopened to traffic at about 2 p.m. today. The roadway has been closed since December 2007 when the old bridge was demolished. In 2006 the Milwaukee Street bridge averaged about 7,200 vehicles per day and it was expected that number would be the same when it reopens. The new Milwaukee Street bridge is an open arch structure with a Texas concrete rail. Because the Milwaukee Street bridge is listed on the National Register of Historic Places, the designs for the new bridge had to be aesthetically similar to the old structure. The old Milwaukee Street bridge was a three-span, open spandrel, reinforced concrete, continuous-rib-arch bridge that had a structure length of 240 feet. It was constructed in 1930 by Eau Claire Engineering and designed by Daniel B. Luten. The new bridge has been expanded to three travel lanes, with two moving east and one going west. The two eastbound lanes are about 25 feet wide and the westbound lane is approximately 15 feet wide. With the sidewalks and the area for bicycles, the entire bridge is almost 60 feet wide. The overall width of the old bridge was 42 feet, which included a 30-foot-wide roadway. The designs also called for the river walk on the east side of the river to be extended south under the bridge. The stairs to access the river walk from Milwaukee Street have been replaced with a ramp. Along with the replacement of the bridge, the project also included the reconstruction of the Milwaukee Street intersections with South First and South Water streets. A southbound right-turn lane has been added to South Water Street, as well as a second eastbound through lane where it intersects with Milwaukee Street. The intersection has also been extended to the south to help smoothen out the three lanes of traffic on the bridge. The concrete islands at the intersection of Milwaukee and South First streets have been removed and the intersection has also been widened. The entire project has a cost of $3.1 million and the city will be responsible for covering 20 percent of the total, which is $620,000. The remaining amount will be covered by state and federal funding. City officials and those involved with the project will hold a ribbon cutting ceremony on the morning of Nov. 15 to officially celebrate the reopening of the bridge. R. Achtenhagen's opening at his place of business in Cole’s block last Monday was a grand success in every respect. The place was crowded with anxious buyers from morning until late in the evening, and all admired the elegant stock and especially the low prices at which it was offered for sale. The fine display of floods in the show window was very attractive, and was admired by everyone who saw it. Mr. Achtenhagen is certainly a subject for congratulations on the success of his opening, and a beginning so successful is a fine indication of a good business career to follow. H. L. Beckmann (Beckman), of this city, is the inventor of a handy device called the "Little Wonder" door fastener, which is used as a bolt to secure doors from opening. It is made so as to apply to any door and is small enough to be carried on a key ring. It should become quite popular with travelers. A fair-sized audience was tortured by an "Uncle Tom' s Cabin Co." at Concordia opera house on last Tuesday evening. It was the worst attempt ever made here in that line. F. A. Cooley is erecting a building for mercantile purposes, on the corner of Western Avenue and Fifth Street [413 Western Ave]. Main Street must look to its laurels if it does not want to see trade leave it and seek new channels. Business is working south, evidently. 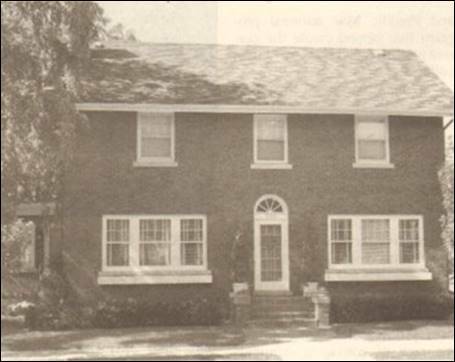 The Theder home was built in the early 1900s as a parsonage for the then adjacent First Congregational Church. Many parents and children will remember fondly the home being used as the Gingerbread Preschool. The home was decorated with all of the preschool decorations including a fire escape on the front of the home. Using Peg's talents as an interior designer, she saw the potential of returning the home to a residence, and in 1989, they purchased the home. After extensive remodeling of the entire home, it is home now to her interior design business as well as Tim's landscape contracting business. The home was filled with many treasures and holiday decorations that the family has enjoy throughout the years. One feature of the home is the sun room, which was decorated with a unique Christmas tree used to display Peg's collection of Village Homes complete with a train set. The living room tree is adorned with wooden ornaments Peg painted the first year they were married. Tim and their son, Tyler, are passionate about hunting and fishing. Their favorite pastimes are showcased with whimsical ornaments and continued over into a trophy bedroom. Members of St. Mark's Evangelical Lutheran Church, 215 N. Sixth St., will say farewell to the Rev. Donald Sutton this week. Sutton, who has served the congregation for the past 13 years as family/youth pastor, has accepted a call as pastoral coordinator of the ministry team at St. Paul's Lutheran Church in New Ulm, Minn. It's goose-noodling time in Watertown again. The once widespread practice of “stuffing geese” for the holiday trade is now down to a trickle, but this year some 200 genuine Watertown stuffed geese will be readied here at the home of Mr. and Mrs. Fred Rumler, 727 North Church Street. And most of them will wind up on the plates of smart diners at Luchow's Restaurant on 14th Street in New York City. Luchow's is now in its 76th year of operation. In recent years the restaurant, which is known the world over for its fine dishes, has been taking the bulk of the stuffed geese from Watertown. Shipments are made through Kerr's Poultry and Egg House in Watertown. The entire hardware stock of E. A. Heck, with the exception of the tinkers' [tinners?] tools, has been disposed of by the mortgatees, Frank Stercinski and Mrs. Charles Noack, to D. & F. Kusel and removed to their store.
. . . After Martin and Dorthea Volkmann of Statien, Germany, sailed to America in 1857, they settled near Watertown, Wisconsin. The following year the Volkmanns loaded a wagon and moved to Kansas Territory with their five children, Frank, August, William Frederick and Wilhemina. The trip took eleven weeks, including two weeks in Iowa waiting for a rain-swollen river to recede. The wagon was pulled by a team of oxen from Watertown to the settlement at Lyons Creek. The Volkmanns settled in the Lyona area where they began to farm the rich Kansas soil . . .
During the year 1894 there were 226 arrests made by officers in this city. The statistics as compiled by the chief-of-police show the nature of complaint and number of arrests as follows: Assault, 29; abusive language,27; drunk and disorderly, 17; petit larceny, 11; carrying concealed weapons, 4; obtaining money by false pretenses, 3; malicious mischief, 3; indecent exposure,2; threats, 2; resisting officer, 2; bastardy, 1; grave larceny, 1; assault with intent to rob, 1; non-support, 1; jumping board bill, 1. Julius Schoechert has been appointed special policeman for the west side without pay. Mr. Schoechert will make it interesting for evil doers in that section of the city. New officers for 1984 were installed at the recent Christmas meeting of AARP Chapter 2007 held at the Watertown Country Club. Mrs. Lucille Gronert, the first president of AARP Chapter 2007, installed the following officers: Mrs. Adeline Lattimer, president; H. Zimmermann, first vice president; C. Coogan, second vice president; Mrs. Dorothy Draeger, recording secretary; Mrs. Peg Buckland, corresponding secretary; and Mrs. Lillian Wilde, treasurer. Named as directors for two-year terms were Leona Strohbusch, Ruth Funk, Russell Gallup and Ervin Finder. Members of the nominating committee for two-year terms are Irene Splinter, Milton Bender and Margaret Pfeifer. For the first time in the history of Watertown a Republican mayor will be at the head of the city government the ensuing year, Justus T. Moak having been chosen at the municipal election yesterday by a clean majority of 134 over ex-Senator W. S. Voss, mayor for the past two years, and who a year ago received a majority of 519. The outcome of the mayoralty contest is quite generally a surprise, and especially so to the "powers that be" in the Democratic Party here. It cannot, however, be considered a purely Republican victory, but rather one for reform and the practice of stricter economy in the administration of the city's affairs. From the result it is quite evident that the majority of our citizens is dissatisfied with the present regime and wanted a change, and especially it is true of the common classes. Mr. Moak's election is due to the generous support of his Democratic friends who had become dissatisfied with their own party's representatives in office, for it is an undisputed fact that without the aid of this faction the Republicans would not have been successful. The first meeting of the Common Council and the inauguration of Mayor J. T. Moak occurred last evening. Long before the time for convening, the lobby of the council chamber and the corridor communicating were crowded with citizens interested in the proceedings. The aldermen-elect entered the chamber in single file and took their respective seats, closely followed by the incoming and outgoing mayors. Mr. Moak was formally introduced by Mr. Voss, the clerk called the roll and the oath of office was administered to the body by City Clerk Bieber. The council was then ready for business. The family of Thomas Darcey, 107 North Montgomery Street, was poisoned one day last week from eating brick cheese. Timely medical assistance avoided fatal results. A new post office has been established in the eastern part of the town of Watertown, in the Wieman homestead, six miles from the city. It is named Aliceton, and W. MetcaIf, formerly of Farmington, is the postmaster. Mr. MetcaIf has built a store at the place and keeps a general merchandise stock. The seventh dinner meeting of the G.B. Lewis 25 year club was held Wednesday night at Otto's Inn. Two new members were welcomed into the club who had served the company 25 years: Herbert Knoll and Ray Erdmann. Those in attendance who served the company for 25 to 48 years were: Otto Wendt, Otto Erdmann, Loretta Irving, Edward Wiese, Gordon Frater, Herman Gerth, Walter Kaercher, Herbert Riedemann, John Erdmann, Karl Lange, Arthur Killian, Neil Follensbee, Carl Wollin, Carl Stark, Raymond Erdmann and Herb Knoll. A community program that has been well received in the past will again reach out to residents. The Bread and Roses meal program, which provides a free meal to anyone in Watertown, is being reinstated, according to committee chairwomen Jean Kwapil and Judy Hoffstetter. The dinners will be served Thursday evenings at Immanuel Lutheran Church fellowship hall with the first one served Jan. 14, 1999, from 5 to 7 p.m.
Eighty new Christmas wreaths are on display on Main and South Church streets in Watertown. The lighted wreaths are being paid for by donations to the Watertown Chamber of Commerce. There will be an annual expense of approximately $1,500 to provide the annual Christmas season display. People who are interested in contributing to the annual display can contact the Watertown Chamber of Commerce. The city's park, recreation and forestry department is responsible for installing, maintaining and removing the decorations. The Public Service Commission of Wisconsin has scheduled a public hearing for Nov. 19 in connection with the proposed construction of an overhead over the North Western Railroad track one-half mile north of Watertown. An overhead will be constructed in connection with the highway 16 bypass project. The hearing was scheduled as a result of a petition which the State Highway Department had filed with the commission on Oct. 21. The commission is now investigating the petition. All expenses in connection with the investigation, which include checking the books, accounts, practices and activities of the railroad, will be assessed against the railroad. The Flower Box, a floral shop on North Fourth Street, has been purchased by Tom Schwefel, former designer at Draeger's Floral and Gift Shop. The new owner said the name of the floral shop will be changed after Jan. 1. The Flower Box was operated by Jeanne Robinson for the past two years and was formerly Flowers by Alice. Schwefel said he will continue the services offered by the previous owner including supplying fresh cut flowers, blooming plants and green plants as well as floral arrangements for funerals, weddings, birthdays, anniversaries and other occasions. David W. Hertel, 201 N. Church St., was appointed Tuesday night to represent Aldermanic District No. 7 on the Watertown Common Council. Hertel, who previously served on the council, said he stepped forward to fill the position vacated by Tracy Terrill because of his continuing interest in city government. He will fill Terrill's term until the April election. The council appointed Hertel with a 5-3 vote, the other votes being cast for candidate Julaine K. Appling, 510 W. Main St. Hertel began his service on the board immediately, after being sworn in by city Clerk Mike Hoppenrath, who was dressed in a green shirt and red Santa hat. The new design of the Watertown Daily Times has been received favorably by our readers. Thursday was the first day of the design changes and staff members have received positive comments from many readers. The masthead was changed back to a more traditional style with a banner across the entire top of the front page. The Bodoni typeface, used on the Daily Times masthead for most of the 88 year history of the paper, has returned. In addition, the day of publication of each paper is in a reversed typeface and placed as a ribbon on the right side of the masthead, providing for quick identification of each issue. The second section was also redesigned to follow a format similar to the front page. An evangelist who graduated from Maranatha Baptist Bible College has been selected as president of the college, officials have announced. Dr. Dave Jaspers will take the helm of the Watertown institution on Jan. 4, 1999, only the third president in the college's 30-year history. He was selected for the post after a unanimous vote by the college's board of trustees. After 13 years of pastoral and evangelistic ministry, Jaspers' appointment marks a return to his alma mater. The committee of the City Council and citizens having the Lincoln Day celebration in charge for Friday evening of next week at Turner opera house met at the city hall last Wednesday evening and perfected all arrangements. C. McGee, of Milwaukee, one of Wisconsin’s most gifted orators, will deliver the address and the Apollo Club and the Northwestern University Band will furnish the music. At 8 o’clock p.m. a procession will be formed fronting the city hall, composed of the Mayor and the City Council, the speaker, G.A.R. Post, the Kriegerverein, Northwestern University cadets and, headed by the Northwestern University band, will march to Turner opera house, where an appropriate program will be rendered. O. D. Pease Post No. 94, G.A.R.
. . . Turner opera house was packed to the doors. It was nicely decorated in honor of the event; a large portrait of the lamented president draped with flags was suspended over the stage. On the stage were seated the executive committee of the celebration, the council committee, the citizens' committee, the Grand Army committee and members of the Apollo Club. W. D. Sproesser presided and introduced the speaker of the day, Attorney C. A. McGee of Milwaukee. Mr. McGee is certainly a gifted orator and his subject was handled very eloquently and patriotically, all present being delighted with his remarks. The singing of the Apollo Club, directed by Edward L. Schempf, was particularly appreciated. Mrs. William F. Whyte accompanied the club's vocal numbers in her usual artistic style. W. D. Sproesser read Lincoln's Gettysburg address in a very creditable manner and the Northwestern University band, directed by Prof. H. A. Frank, played several patriotic selections. Following was the program in full . . . The Apollo Club of this city is contemplating to produce on a large scale one of the grandest and most beautiful musical works, Hayden's "Creation" at their next concert. In fact, the rehearsals of this masterpiece have begun and there is sufficient artistic spirit among members of the club to guarantee a perfect production. But it takes a large chorus to make this composition effective, to bring out the powerful and wonderfully harmonious choruses and to make the beauty of their melodies impressive, especially in such choruses as “The Heavens Are Telling." The management of the Apollo Club therefore wishes to arouse the interest and enthusiasm of everyone who is interested in music and chorus singing and asks them to join the club, to help swell the numbers and the volume of the voices, to profit by studying this grand work and to assist in the production of one of the finest compositions ever written. Let everyone who feels so inclined be present at the next rehearsal in the Masonic Temple on Tuesday evening, February 2, at 8 o'clock sharp. Part of this rehearsal will be devoted to the study of the choruses for the Lincoln memorial celebration, for which occasion a large chorus is also desirable. But besides a large chorus, the financial support and backing of our public spirited citizens is necessary for the undertaking of such a great work. An orchestra of at least eighteen of Bach's best musicians is needed to make the production worthy of the masterpiece, besides soloists for the different solo parts. In fact the expenses will be extremely high and the management of the Apollo Club has therefore set a list in circulation for a guarantee fund, each signer to guarantee a pro rata share of five dollars of any possible deficit. The endeavors off this club to offer to the music-loving public only the best at its concerts deserves a better support than has been given heretofore, and the management feels that this is their last effort to secure this support. If sufficient interest and enthusiasm does not exist among the citizens of Watertown to give the support and approve the faithful work done by the Apollo Club, then the club has no cause for existence. It would indeed be too bad if a city like Watertown could not keep a musical organization above water. Otto Gerbitz has returned from a business trip to Antigo, Nielsville and other towns in the northern part of the state. Mr. Gerbitz has built more houses in Watertown the last two years and done more to improve the residence portion of the city than any other resident. John Hilgendorf, the boss contractor, built all his residence buildings and has put them up in fine shape. Mr. Hilgendorf is a thorough mechanic in his line of work and when he turns over a building to the man who employs him, you can count on it being all right. We want more men like Mr. Gerbitz to build up our city. Otto Gerbitz has built a fine cement walk fronting his home at the corner of West Main and Warren streets. Aside from the walks on West Main and Warren he has built a large cement walk all around his house, which sets it off in fine shape. Mr. Gerbitz has built more houses, and all of them large and up-to-date homes, than anyone of our citizens the past year. He has built up the section of the Third ward between Warren Street and the C.&N.W. Ry., and his enterprise has added greatly to the value of property in that section of the city. We hope that more of our moneyed men will follow Mr. Gerbitz's example and do likewise. He is now building an automobile garage in the rear of his home, and has purchased a fine automobile, which he intends to use both for pleasure and business purposes. Fire broke out at The Office tavern, 1217 River Drive, early today, causing damage to the building and its contents estimated at $100,000. The fire was reported at 4:12 a.m. by a street department employee plowing the streets. When firemen arrived at the scene, the building was already fully involved with flames. Twenty-six firemen battled the blaze which apparently started in the basement and spread vertically into the bar area and then into the attic area. The first floor caved into the basement, making fighting the blaze difficult. Two new directors were elected at the annual meeting of Watertown Memorial Hospital Association Wednesday evening. Elected to their first terms were Cathy Kwapil who will have a three-year term and Pat Caine who was elected to fill the final two years of the term of Steve Foti who has resigned. In addition, Steve Zillmer and John Uttech were re-elected for three-year terms on the board. In addition to Foti, Joy Soderstrom is leaving the board after having served for 11 years. In short, the fundamental facts of human nature apply to men and women who live in the country just as they apply to men and women who live in towns. Given a sufficient foundation of material well being, the influence of the farmers' wives on their children becomes the factor of first importance determining the attitude of the next generation toward farm life. The farmer should realize that the person who most needs consideration on the farm is his wife. I do not in the least mean that she should purchase ease at the expense duty. Neither man nor woman is really happy or really useful save on condition of doing his or her duty. If the woman shirks her duty as housewife, as home keeper, as the mother whose prime function is to bear and rear a sufficient number of healthy children, then she is not entitled to our regard. But if she does her duty she is more entitled to our regard even than the man who does his duty and the man should show special consideration for her needs. I warn my countrymen that the great recent progress in city life is not a full measure of our civilization, for our civilization rests on the wholesomeness, the attractiveness, and the completeness as well as the prosperity of life in the country. The men and women on the farms stand for what is fundamentally best and most needed in our American life. – Theodore Roosevelt, The White House, February 8, 1909. Chas. 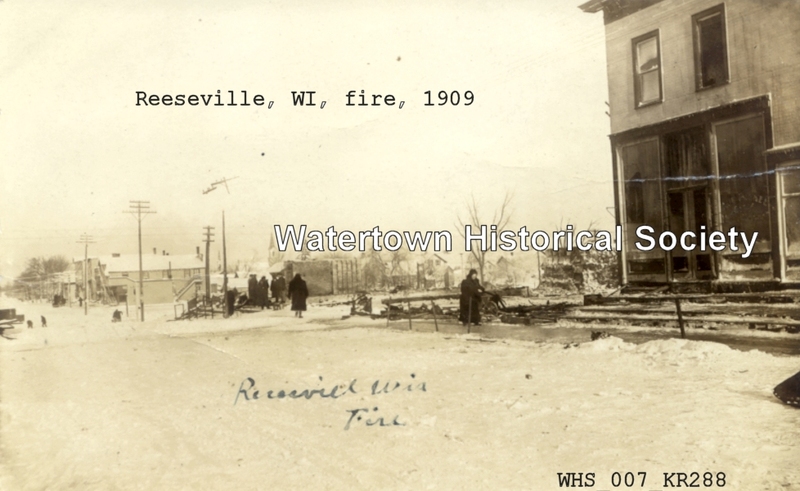 J. Wench has removed his fire insurance office from over Raue's store to the Bank of Watertown building. For over 30 years he occupied a joint office with August Tanck on Main Street, but the increase in business of both gentlemen now requires separate offices. Unveiling at First Methodist Church. A most pleasing and appropriate service was held at the close of the Sunday school hour at the First Methodist Church in the assembly room last Sunday morning. It was the occasion of the unveiling of a faithful likeness of the late Jonas Stahl [1836-1907], who, for thirty years by fidelity in service and sweet voice in song was the inspiration of the Methodist Church and Sunday school. After singing by the school, the pastor delivered an address in memory of the departed. The Sunday school flag, the stars and stripes, was removed from the wall and as the audience looked upon the likeness of this good man ("Old Faithful" we love to call him), it seemed that his very presence was among mortals. The Sunday school was gladdened by the presence of Mrs. Stahl, who is again able to be about, besides many visitors. The picture is an enlarged photograph done by the Watertown Photograph Co and is the gift of Mr. and Mrs. Harry Forncrook, of 313 Warren Street, who with many others love to revere his memory. Bach's orchestra of Milwaukee will furnish the music for the Elk's ball at Turner opera house next Monday evening, Washington's birthday. The decorations are being prepared on a very elaborate scale, and it is said will exceed in beauty anything in the decoration line ever attempted here. Last Friday evening the pupils of 4th grade No. 4 School enjoyed a sleigh ride to the home of H. F. Scholz, town of Emmet, where they were right royally received by Mr. Scholz and family. They were chaperoned by their teacher, Miss Alina Kirchhoff. On their return to this city they wound up at the home of G. A. Stallmann, where Mrs. Stallmann, assisted by Mrs. M. F. Blumenfeld, served them with refreshments. A spelling contest was indulged in, Miss Ada Wegemann receiving the prize. Monday evening the teachers of No. 2 School gave a valentine party at the school building to a number of teachers of the other schools. The school room was very prettily and appropriately decorated. Games and guessing contests were indulged in and refreshments were served in three courses. The affair was a decidedly pleasant one. Those present were the Misses Edna Voss, Ida Barganz, Sophie Koehler, Josie Voss, Thekla Krebs, Ida Kopp, Anna M. Holland, Mary Crangle, Ella Sipp, Leona Steinmann, Katie Brasky, Emma Wittchow, Mamie Stacy, Margaret McGrath. Respectfully dedicated to my childhood friend, Charles E. Straw, Watertown, Wis.
H. J. Darton, for many years a resident of Oshkosh and employed as a locomotive engineer in the railway passenger service from Oshkosh to Antigo during that period, was in our city a few hours on Friday last. He failed to meet one of our old residents whom he desired to see. He called on Schlueter Bros. stating that 38 years ago he had fired a locomotive for C. E. Straw, who was at that time acting in the capacity of engineer for the Milwaukee Road. Failing to find his old comrade, Mr. Straw hopes he will come this way again, and says that Henry is not very wide from the mark, it being just 37 years past that he had charge of locomotive No. 147, and named "John Bailie", after the head of the car department. This engine was built in Boston by Hinkley & Williams, and was known as a "cold water Hinkley," like many more of same brand owned by the C. M. & St. P. Ry. at that time. The "Bailie" and crew that followed the No. 147 was in charge of Joseph Bilty, conductor, and served the stock yards, also the packing houses out on “the marsh," as that district was then known to all railroad residents in Milwaukee; same section of land is now covered with a network of tracks. Our friend Dudley Fitzgerald at that time, 1872, was in charge of the "south yards" during the long hours of the night. Have you ever been on a Watertown trolley car? It is a fine craft, rocking along in fine style. If the swaying motion doesn't exactly lull one to a state of blissful unconsciousness, it will assuredly make him at times feel like taking a good snooze. They have several little conveniences too for the security and comfort of the sleepy or seasick passengers. The window sills particularly were devised especially for convenience in resting the arms and elbows when it is impossible to sit up without something to hold onto or lean against. A young gentleman from the west side has it in for the trolley cars. He says but little about it himself, but a number of happy and joyous fellow passengers are telling it. He got on one of the cars the other night, and the only unoccupied space being by the side of a pretty, well-dressed and refined-looking young girl, he took the seat, although with apparent diffidence. The young woman's elbow was on the window next to him. She had found it necessary to brace against something, being evidently worn out with a round of strenuous shopping and the car careening and plunging along like a merry-go round. When the car bumped passed one of the side streets the girl’s arm slipped from the window, and in some inexplicable way onto the young man's shoulder. She was certainly sound asleep, he says, and he is equally certain, in his modest way, that she did not open her eyelids previous to this unfortunate accident. He being a young man of retiring disposition and somewhat inclined to bashfulness in the presence of ladies, found himself in a delicate position. It was very evident to the other passengers that it was a serious problem. The perspiration starting from his forehead showed this, also the fixed and glassy way in which he gazed at the "Uneeda Beer" advertisement on the opposite side. Several acquaintances of his among the passengers were making unseeming exhibitions of mirth over his unfortunate predicament. One man was trying to place a bet that he would stay to the end of the line and back again, unless the girl woke up, and each and every villain agreed that he would stay on the car as long as he did. He didn't know what to do. If he got up, the girl would wake and be embarrassed; if he stayed, those devils in the car would never let him hear the last of it. Just when he had given up all hope, the conductor shouted "tickets," and the girl awoke with a start, shot one glance at the bashful young man, smiled happily, and went to sleep again. The choir of St. Paul's Episcopal Church is actively engaged in rehearsing Stainer's sacred cantata, "The Daughter of Jairus," under the direction of Edward L. Schempf, to be sung Friday evening, February 19, in St. Paul's Church. Some of the best musical talent of Watertown are assisting in this work and it undoubtedly will be one of the musical events of the season. Mrs. William Sproesser will sing the leading soprano parts; Edward L. Schempf, tenor; William Sproesser, baritone. The augmented choir will be accompanied by the organ, with Mrs. Elizabeth Green as organist, and a small orchestra, including a cellist from Milwaukee who has been specially engaged for this occasion. The fact that the cantata is the work of the celebrated musical writer, Stainer, is sufficient evidence as to its worth. It abounds with beautiful solos, duets and choruses. A treat is in store for all lovers of music who take advantage of this opportunity. The effect of the combined chorus, organ and orchestra is truly grand and inspiring. This cantata was sung by St. Paul's choir a number of years ago and the concert proved a splendid musical event. The price of admission has been fixed at thirty-five cents. Tickets may be obtained from members of the choir and at Eberle's and Schempf's drug stores. A number of Watertown business men and their ladies growing weary of city life and longing for one of the “good old times" in the country that they so much enjoyed in years gone by, arranged last Wednesday for a sleigh ride and in order to add life, grace and beauty to the crowd, a few young ladies and gentlemen of this city and the adjoining towns of Shields and Emmet were invited. Two bobsleighs were comfortably fitted out and at 7:30 o'clock the party started for the home of Michael Casey and wife, town of Emmet. The sleighing being good and the weather moderate, of course the ride was a most enjoyable feature of the evening's program, especially to one young gentleman who occupied the hindmost corner of one of the sleighs. He went through several stunts that left several of the young ladies in good humor all evening and they remarked "oh, we are so glad we came, we never experienced such joy before," and the young man said "ditto," and began singing "Sweet Marie.” "That is well put," shouted everybody, "we guess you heart is in the song.” There was no proposal, however. At about 8:30 the home of Mr. and Mrs. Casey was reached and here a wide-open hospitality was extended and it only took a few moments for all to feel at home, and they certainly had one of those "good old times." The fore part of the evening was passed in social converse and at cards. The honors at cards were won by a ten-year-old son of Mr. Casey, who showed the city folks a thing or two about playing cinch. At 10:30 a delicious luncheon was served, at which two legal lights from the city officiated as toastmasters. It is not often that at a festive board two toastmasters are tolerated, but in this case it was absolutely necessary to keep these gentlemen talking, else the rest of the party might possibly run short on rations. Supper being over, one of Watertown's substantial business men suggested a quadrille, and as there were several violinists present and a number of good pianists, his motion found numerous seconds, and on went the dance. The aforesaid business man was the first to give vent to his feelings as he tripped the light fantastic and enthusiastically remarked: “I’m just as good as I was 20 years ago.” The prompter winked at the other gentlemen in the set and kept said dancer so busy with “right and left four,” “grand right and left,” “swing the one on the corner,” etc., that it was not long till it was very apparent the merry swirl was proving too much for the gentleman from Watertown and his partner remarked this is no place to have “Fitz” and they scooted to a cozy corner and indulged in a cheese lunch, a commodity that the gentleman is a better success in manufacturing than in trying to outdance two lawyers and an editor. We’ll let him down easy—for he administered to our wants at the hour of parting and saved our life in our journey home. At intervals during the evening vocal and instrumental music enlivened the occasion and all present joined in the choruses. It began to be noised about the house that we had a celebrated warbler amongst us and after great persuasion on the part of the ladies the warbler got to work—and the ladies began to holler “Oh, Mabel, isn’t it terrible.” Several of them laughed till they swooned away, but it was no use, the warbler kept on—the shingles on the house began to drop off and all the sparrows for miles around were attracted to the neighborhood—no use—his wife threatened divorce—nothing doing—he kept on—finally a brother lawyer present got out an injunction against him and he stopped short—but it was out of the frying pan into the fire—and worse—we had a standard oil warbler present, he remarked the machinery needs oiling, and he took up the key where his legal friend left off, and the only way relief was found [was when] some one hollered, "all board for Watertown." There was a sudden halt—some one remarked its 1 o'clock—another "it's a shame to keep these people up so late." A vote of thanks was given Mr. and Mrs. Casey and their interesting family for the excellent time given them under their hospitable roof, and good night was said, all leaving for their homes with fondest memories of a winter’s night in the country at one of the finest homes in Dodge County and with one of its most esteemed families. The supply of toys which the Fire Department repairs and turns over to the Family Welfare Association for distribution, has hit a new low this year, firemen disclosed today. Fewer toys than ever have been received this year, the men regretfully report. For a period of a great many years the firemen have conducted a toy repair project. They welcome all sorts from small toys to larger items like bicycles and sleds. All are placed in first class condition and repair. Turner Opera House was packed to the doors last Tuesday evening to witness the performance of the Watertown Imperial Minstrels, and the excellence of the entertainment furnished, well deserved the magnificent audience. From start to finish everybody was amused, and it certainly was one round of pleasure. The hall decorations were very artistic and added interest to the occasion. W. J. Bethke officiated as musical director and the Weber-Stube orchestra furnished the music and accompanied the vocal numbers. John F. Berigan made a most excellent interlocutor. The minstrels were made up as follows: Comedians—F. P. McAdams, Lew W. Parks, Otto V. Knaak, bones ; Gordon E. Bacon, C. A. Kohn, John J. Lietz, tambos. Vocalists—William L. Schlueter, E. J. Hoermann, Joseph Glaus, William F. Richards, Joseph J. Raue, Carl F. Otto, Edward C. Wolfram, J. C. Weber, Baldwin S. Raue, Frank G. Exner, George A. Richards, Roman M. Hahn. In making my bookings for the coming season I have secured many excellent and meritorious attractions. Among the number I am pleased to announce that I have secured The United Players Company's big production of Eugene Walter's great play, "Paid in Full." This is the play that ran for two years in New York and six months in Chicago. "Paid in Full" practically needs no introduction to the theatre-going public. It has been known ever since its initial performance as the greatest American play, and the present production that I have secured has lost none of its strength and beauty in its presentation by the United Players Company, as they have a complete and adequate equipment of special scenery and a carefully selected company of metropolitan players of actors and actresses, and I sincerely trust that my patrons will show their appreciation of this opportunity to witness this exceptional play and performance by extending their liberal patronage to my theatre on Tuesday, September 20, the date of the company's appearance here. Next Sunday evening at Turner Opera House promises to be a notable event, the occasion being the first presentation in this city of "Ishmael," the play that is setting all the country talking, and is creating a furor in theatrical circles. "Ishmael" is a dramatization by Grace Hayward of Mrs. Southworth's widely read story "Ishmael." Miss Hayward has also drawn upon Mrs. Southworth's "Self Raised" for some of the incidents and scenes of the play, and as a result of the combination of the two, this clever dramatist has created a play that bids fair to surpass the wonderful success of her “Graustark" and "St. Elmo." "Ishmael" is so different from the usual run of plays that it leaves a distinct impression of its own upon the mind of the spectator. The story and theme are new. There is an abundance of bright dialogue, droll humor and the pathos and sentiment of the play are not of the artificial sort. The stage settings are remarkably elaborate and many of the scenes art so well managed as to receive hearty applause. The engagement of “Ishmael" promises to be a record breaker. New figurines almost life-size enhance the scene at Bethesda Lutheran Home as the grounds and buildings take on a Christmas atmosphere. The supervisor of manual arts training, Martin F. Heinemeier of 120 South Washington Street, obtained the set from a manufacturer in Milwaukee. The group is enclosed in a green arbor setting against the east wall of the manual arts school building. It can be viewed by taking the “service road” and visitors are welcome to see it. A new Watertown Police Department would be constructed near the high school under a plan unveiled by the Watertown Unified Board of Education Tuesday night. Under the proposal, the school district would donate approximately 8.73 acres on the high school site to the city of Watertown. The city, in return, would build Elm Street through to Carriage Hill Drive and otherwise develop the surrounding property. The plan would be contingent on voter approval of a referendum to construct a new facility. The Watertown Board of Education agreed Thursday night to several land transfers that will allow for construction of a city police station near the high school if voters agree to the project in a possible referendum. School and city officials expect the deal to be finalized in the coming days by attorneys for the city and the school district. The plan for the land swap was developed to allow for the construction of the station on land owned by the school district on the south end of the Watertown High School property . The parcel would front on an extension of Elm Street the city is planning. As part of the land transfer plan, the district will deed to the city a right of way needed to extend Elm Street from its westerly terminus at Fremont Street west to Carriage Hill Drive. The school district will also deed to the city a 4.98-acre parcel along the south side of the Elm Street extension, and about .59 acres along Carriage Hill Drive. The district will also trade a 1.13-acre parcel along Carriage Hill at West Main Street to Maranatha Baptist Bible College in exchange for a 1.06-acre parcel south of the 4.98-acre parcel. The Watertown School Board will be asked to give the go ahead for preparation of educational specifications for a new high school when it meets at 7:30 p.m. Wednesday in the board room of the Educational Service Center, 111 Dodge Street. Preparing the specifications will be done by Dr. John H. Fredrickson, the school facilities consultant who has prepared a phase I study dealing in general with eventual construction of a new high school. The phase I report will be presented Wednesday for reactions from board members, who may take some action on it at a later date. The report will be detailed in Tuesday's Daily Times. Construction of a two-bedroom senior citizen apartment complex was approved unanimously at a joint meeting Monday night of the Marquardt Memorial Manor and Moravian Homes boards. Known as Hus Apartments, the complex includes 22 apartments and provides the first two-bedroom development for senior citizens in Watertown. The non-subsidized apartments are restricted to persons 62 years of age and older. The complex, to be built north of Marquardt Manor, 1020 Hill Street, will cost about $1.15 million, according to Boyd Flater, executive director. Flater said that plans have been completed and that details of contracts are being worked out. He expects construction to begin in about two weeks, with occupancy on June 1, 1984. A new educational foundation dedicated to promoting and strengthening public and private schools in the Watertown area has been formed. Educational Foundation of Watertown, Inc., is a nonprofit, tax deductible corporation. It is accepting funds which can be donated to any individual school or any educational purpose the donor wishes to support, according to Ray Kubly, foundation president. Plans are now under way for the development of a new logo for the foundation. A $100 savings bond will be awarded to the winner of the logo contest. What began as a nondescript bus turnaround on a miniature model of Watertown High School more than five years ago is now a blooming example of what students and a devoted teacher can do when they set their minds to it. That bus turnaround, once an island of grass surrounded by parking lots and sidewalk, is today a sea of color in the form of a peace garden. Students envisioned it as a place for inward reflection, a break from tile floors and concrete block walls inside the high school, which was opened in 1994. Social studies teacher Steve Jacobson has been a mentor for students involved in the project, and his own ideas have meshed with theirs. Taxpayers of the city who desire to have street sprinkling done the coming season, and whose premises are now not included in the sprinkling district, should notify Alderman H.C. Mayer, chairman of the committee on streets and bridges, or any of his fellow-members, before the next meeting of the common council, Tuesday, February 6. It is necessary to have these applications in as early as possible, so that the several districts can be arranged as specified before the contract is let. According to the system now in vogue, the cost of sprinkling is based on the assessed valuation of the property benefited and inserted in the tax role. The season for sprinkling begins April 15. Joseph, the four-year-old son of Mrs. Lilian Brandenburg, proprietor of the New Commercial Hotel, was bitten in the face by a dog in the lobby of the hotel last Sunday afternoon. Dr. Shinnick cauterized the bite and advised the taking of the boy to the Pasteur Institute, Chicago, and he and his mother have been there for several days. At about 1 o’clock Friday morning fire at L. H. Cordes’ home in Third Street destroyed it to the extent of about $400. Mrs. Cordes smelled rubber burning as she lay awake in bed and aroused her husband. He went downstairs and discovered fire in the pantry. The house phone was just over the blaze and he went to a neighbor and sent in an alarm to the fire department. In the pantry there is a combination gas and electric fixture which was in an imperfect condition and set fire to the woodwork in the wall and it spread rapidly to the bathroom above. The fire department responded promptly and the aid of chemicals put the fire out in short order. Defective electric covering and gas also was the cause of a small fire at G. Fuermann’s in North Fourth Street on Friday. Second Lt. Ronald Kapheim, son of Mr. and Mrs. Clarence Kapheim, North Church Street, recently was awarded his wings following a nine month period of primary training with the Air Force. He received his training at the Harlinger, Texas, Air Force Base. Ronald now is spending a leave at his home here. Upon his return he will be transferred to an Air Force base at Waco, Texas, where he will receive training as a radar observer on an all weather jet interceptor plane. Firing up the burners will have a whole new meaning Monday when Zwieg's restaurant begins another era with a new grill. After turning out burgers by the bagful for the past 52 years, the original grill had begun to feel the heat. Thursday was its last gasp. A new grill is being installed today to replace the one that dates back to 1946. The old grill was a familiar sight in the small family restaurant where patrons seated on counter stools can watch cooks flip rows of sizzling burgers while the smell of frying onions wafts through the air. There will be an open seat on the Watertown Unified Board of Education next spring, as one of three incumbents has declared he will not run again. Terry Grinwald, board president, signed a statement of noncandidacy Tuesday, the district office reported. The two other incumbents whose terms expire in April, Barbara Phelps and Mark Putra, submitted their statements of candidacy Tuesday. Wisconsin-Michigan Trailways will be serving the Watertown area Monday with six buses per day, according to Bob Moore, Green Bay, home office of the bus service. The Watertown terminal will be located at General Rental Center, 211 North Third Street. Three of the buses will go west to Madison and three will go east to Milwaukee. Moore said Trailways seeks to serve residents of Watertown and the surrounding area on a permanent basis, and not just for the duration of the Greyhound bus strike. Buses will carry passengers and packages weighing up to 150 lbs. Rock River Pizza Co. and River City Distributing Co. are sponsoring a fund-raiser that will benefit the Watertown Fire Department. Every time a customer at Rock River Pizza Co. purchases a Hook and Ladder product or makes a donation, they will be entered into a drawing where they can win a mini chopper motorcycle. Proceeds raised during the event will be donated to the Watertown Fire Department and local National Burn Centers. The drawing will be held on Dec. 17. The mini chopper was donated to the Watertown Fire Department by River City Distributing Co. The fire department then donated the chopper to Rock River Pizza Co.
Carl V. Kolata, head of radio station WTTN who is serving his first term as a city councilman and whose term expires on next April 21 announced late Wednesday afternoon that he will not be a candidate for re-election. His intention to retire at the end of his term had been rumored for several weeks. Of the other two councilmen whose terms expire on April 21 - Fred W. Kehl and Charles E. Kading - only Mr. Kehl has indicated to date that he will seek a second term. Watertown businessman Royce Rowedder was elected to a second term as president of the Health Planning Council (HPC) at the agency's 15th annual meeting. Rowedder has represented the Jefferson County Health Resource Committee on the HPC Board of Directors since 1981, and in addition to holding the office of president, has served for three years on the administrative committee. HPC is an independent, nonprofit agency serving 11 counties in southern Wisconsin, and is one of many such Health Systems Agencies located throughout the United States. To the Honorable Mayor and Common Council of the City of Watertown. Gentlemen: The undersigned, to whom was referred the matter of building a new school house [Lincoln School] in place of the present No. 2 building in the Fourth ward, beg leave to report. That upon careful consideration of the matter we are satisfied that it is necessary to build a new school house as aforesaid, and we therefore recommend that the Common Council introduce at this meeting if possible an ordinance authorizing the issue to bonds preparatory to the building of such school house, and as it will be necessary to lay such ordinance over until the next meeting of the Common Council, we further recommend that the chairman of the committee on public buildings of the Common Council, and the chairman of the Committee on Buildings and Grounds of the Board of Education, invite competition in the matter of considering other plans for a new school building, besides the one thus far procured, provided, that they can secure sketches of such other plans from architects or contractors without a great expense to the city. On February 2, 1909, the Board of Education addressed the following communication to the Mayor and Common Council of the city of Watertown, Wis.
To the Hon., the Mayor, and Common Council of the city of Watertown, Wis.
Gentlemen: At a regular meeting of the Board of Education, Dec. 2, 1908, a resolution that it is necessary to erect a new school building [Lincoln School] in place of the present school building No. 2, in the Fourth ward of this city, was unanimously adopted. The probable cost of such proposed building will be THIRTY THOUSAND DOLLARS ($30,000 ). At a special meeting of said Board of Education January 21, 1909, the plans herewith submitted for your approval were duly adopted. The material in said old school building may be used in the erection of a new school building, and it would be advisable to authorize and instruct said Board of Education to offer the same for sale in the call of sealed proposals for a new building to contractors, the proceeds which may be derived therefrom to be applied on the contract price for such new building. Watertown, Wis., Feb. 2, 1909. By order of the Board, Carl R. Feld, Clerk. The matter was laid over by the council for further consideration. Since then the Board of Education has not as an official body received any official notice from the mayor or council to either sell the old building or go ahead with the contemplated school. We believe the mayor and council as well as the Board of Education are both of the opinion that this work should be pushed from now on, and we understand that at the next meeting of the council the Board of Education will be authorized to proceed in the matter. At the Board of Education meeting last Wednesday night, a resolution was passed, and the clerk was instructed to present a copy of it to the mayor and city council, again setting forth the amount of money needed for the erection of a new school in place of No. 2 school, and requesting the council to authorize the Board to dispose of the old one. The committee on buildings and grounds of the Board of Education was also directed to advertise for proposals for the erection of the new school, and the superintendent, and chairmen of the buildings and grounds and teachers and instruction committees were directed to look up temporary quarters to hold school in while the old school is being torn down, and the new one is ready for occupancy. Should the plans of the school board in this matter meet with no further opposition, the intention is at the close of the present term of school in April to tear down the old school and begin the erection of a new one. The school law of the state requires that school facilities shall be furnished our people at least 9 months in the year, and it is out of the question to grant a long vacation to the pupils of No. 2 School, else the chances are we would receive no state school money. Extra precautions are being taken at No. 2 school by the Board—it is thoroughly cleansed every week and the janitor has been instructed to put in all his time at the school during school hours to see that everything is properly attended to and the superintendent reports that he is faithfully carrying out the Board's instructions. Resolved, That the committee on buildings and grounds be and the same is hereby directed to advertise for sealed proposals for building a new school house according to plans and specifications adopted by the Board of Education. Resolved, That the clerk be and he is hereby directed to officially notify the Mayor and Common Council that the cost of the new school building to be erected in place of No. 2 school house will be $30,000. That the Board of Education has now on hand the sum of $4000 levied last year for repair of said No. 2 school building and which sum is available for the new building. Further, the Board of Education requests your honorable body to authorize the said board to sell the old No. 2 School building to the highest bidder. To the Hon. the Mayor and the Common Council of the city of Watertown. Gentlemen: I hereby transmit to your honorable body the above and foregoing resolutions approved and accepted by the Board of Education March 3, 1909. To the Hon. the Mayor and Common Council of the city of Watertown. Gentlemen: It has been determined and is hereby certified by the Board of Education that the sum necessary for the construction of the No. 2 School house according to the plans and specifications approved and accepted by said board . . .
At a special meeting of the Board of Education held last Monday evening the bids for the construction of the new school building in the 4th ward were opened. Wagner & Baumann of Monroe were the lowest bidders; their compete bid being $30,105, on which they allow a deduction of $1000 for the old school building and $5100 for the heating and ventilating. The Board deducted the $5100 and accepted the bid of Otto Biefeld & Co. of this city for the heating and ventilating for $4952, making the complete bid for the school of Wagner & Baumann combined with the Biefeld bid less $1000 for the old school, $28,957. Following is the full list of complete bids submitted, there being a few other bids on separate parts of the work. At the meeting of the city council held last week Thursday evening, the school bond ordinance was passed, all members present voting for it, hence at a special meeting of the Board of Education held last Wednesday evening the contract for the new school was let to Wagner & Baumann, of Monroe, Wis., the contract price being, $29,957. They pay $1000 for the old school building, which will make the above amount $1000 less. About the 26th inst. the work of tearing down the old building will begin, and it is expected to have the new school completed on or before November 1st . . . The new school building will be a credit to the city—the first story will be of vitrified brick and the second a grayish pressed brick with a tiled roof. It will have a perfect system of heating and ventilating and nothing has been neglected in its planning to conduce to the health and comfort of both teachers and pupils. First grade in Welsh church building in North Washington Street. Second, Third and Sixth grades in the basement of the public library building. Fourth and Seventh grades in the store building at 117 West Main Street. Fifth grade in the Fifth Ward hall. These quarters will be made as comfortable as possible for pupils and teachers and the little inconvenience that will be experienced will cheerfully be overlooked in anticipation of the fine new school building which they will shortly have. Men Wanted to wreck old school building at corner of Montgomery and O'Connell streets. Report at 7 o’clock Friday morning. That due to the well established custom of people coming to town and temporarily stabling their horses in barns maintained in connection with the saloon business in the city of Watertown, back rooms and waiting rooms have been established by saloon keepers for the accommodation of such persons so unhitching for their families while hitching and unhitching their horses, and for such purpose such rooms are recommended and commended. On Saturday, January 23, we visited and inspected saloons maintaining back rooms, making one trip of inspection in the early part of the evening and one later; that we found such back rooms occupied in several instances by minors of both sexes; that some saloons maintained as high as four back rooms; that the same are small and not connected with each other or with the main bar room; that they lead off from a narrow hallway and are each equipped with a door; that in several instances we found them occupied as aforesaid and not properly lighted. We therefore recommend that your honorable body cause the passage of an ordinance regulating such back rooms by limiting the number to one or two such rooms with each saloon to be connected by an open passage-way or partly glass door with the main bar room. And we further recommend to your honorable body and particularly to the license committee that in the future no application for retail liquor license should be acted upon favorably or granted to any applying therefor, unless the premises at which such license is asked for is constructed in accordance with the above suggestion. Along this same connection your committee recommends for your consideration the matter of passing an ordinance fixing a time when all saloons should be closed at night. And we further recommend that when such ordinance is so passed that strict compliance with its terms should be insisted upon by the city authorities and that any deviation therefrom should be punished to be provided for is such ordinance. On said tour of inspection we also found evidence in existence in connection with the saloon business in the city certain nickel machine gambling devices, but we have been informed the state law amply provides for the abating of the same we make no recommendations in the way of passing an ordinance pertaining thereto. Wegemann & Strauss, the enterprising young dry goods firm, has just finished remodeling their store, whereby a commodious cloak room is added on the second floor, with a convenient interior stairway leading to it. This firm keeps abreast of the times and is meeting with well-deserved prosperity. EmiI Luessow, of this city, was arraigned in the circuit court of Oconomowoc Wednesday on the charge of bigamy. His first wife resides in Ixonia and the second would-be wife is a fair resident of Oconomowoc. The jury found him guilty of the charge and sentence will be passed upon him by Judge Sloan as soon as a criminal calendar is done with. Charles Wendtland, of this city, was accidentally shot in the left foot Sunday, while on an outing in the country. The affair occurred on the farm of August Marquart in the town of Emmet, and luckily was not attended by more serious results. While a companion was in the act of loading a shot gun, an untimely discharge took place and the shot entered Mr. Wendtland's foot, quite badly shattering a portion of it. Dr. Spalding was called and dressed the wound. Amputation was not necessary, but Mr. Wendtland will be laid up a few months by the accident. Luminaires will, for the third consecutive year, be the center of attraction in the 300, 400 and 500 blocks of North Washington Street Christmas Eve. Luminaires, lighted candles in sand-filled paper bags, will create a scene of great beauty in the three-block area. The sidewalk display will be ready for viewing by the public beginning at approximately 6:45 p.m. The candles will burn until about 2 a.m. Christmas Day. Forty-four area students in first through fourth grades from St. Henry and St. Bernard Schools entered the Knights of Columbus "True Meaning of Christmas'' poster contest. Entries were judged on the following criteria: 20 points for expression of the Christmas theme, 30 points for originality and 50 points for artistic quality. The winning entries in Watertown were created by Michael Kuckkan in grade one, Ali Hinchcliffe in grade two, Sara Lemminger in grade three, and Erin Haeger in grade four. Their posters have moved on to the Diocesan level where winners will be selected to move on to the state competition. James P. Holland, editor of The Daily Times, left here on Wednesday for Hot Springs, Arkansas, where he will take baths for rheumatism till about March 15. In the meantime the editorial department of The Times will be looked after by J. W. Cruger, one of the proprietors thereof. Mr. Holland’s many friends hope he will find the relief he seeks at Hot Springs and that he will return home restored to health. The Oconomowoc American Legion band, with 85 members, including players from Watertown, will leave Christmas night to represent Wisconsin in the Tournament of Roses parade. Watertown is represented in the Oconomowoc band with a number of players. Included are Marilyn Eske, vocalist; Armund Turke, baritone horn; Will Eske and Ellward Kuehl, trombones; Harold Baumann and William Turke, clarinets; Donald Neitzel and William Kehl, drums; Walter Samstad, trumpet; William Nass, bass horn; William Kehl Jr., clarinet. Donald Timmel, trombone, and Richard Schliewe, bass horn, are from Ixonia. Mrs. Donald Timmel and Marilyn Eske, who is Mrs. Will Eske, will be among those carrying a “Wisconsin” banner and other signs in front of the band during the parade. TOWN OF WATERTOWN - A garage at the W3200 block of Oak Hill Road and its contents were declared a total loss following a fire that started Wednesday evening. According to Watertown assistant fire Chief Ralph Wandersee, the approximately 850-square-foot detached garage at W3256 Oak Hill Road was fully involved in flames when firefighters arrived at the scene around 7:05 p.m. Wandersee said the fire was called in by a motorists who was passing by the garage. The property owners were not home at the time of the blaze, he added. The contents of the garage that were damaged included a skid steer, two lawn mowers, a car and a large number of tools. Damages are expected to exceed $100,000, Wandersee said. Firefighters were on the scene for about two and a half hours. Mutual aid was provided by fire departments from Ixonia and Clyman. Watertown volunteer firemen on the day [in 1877] mentioned above assembled in a body at the corner of Main and First streets at 1 p.m., engines and apparatus brightly shined, also decorated with red, white and blue. It was the second appearance of the Phoenix Co. clad in their new blue uniforms, trimmed with white, and in each horse’s headgear of the team that hauled the Silsby there could be plainly seen the regulation circus plumes, red, white and blue, which added much to the appearance of the west side company’s turn out. The men of the east side wore their regulation red shirts, except the Sack Co., who always appeared in their neat-fitting sack coats of blue. There was little or no snow to be seen, muddy roads, badly frozen and broken up, therefore the parade did not get very far down Main Street. The two-wheeled hose carts pulled by men on foot were very cumbersome and the ladies were pleased to get back to quarters early in the afternoon, and the teams were cared for by their owners in their own barns, S. M. Eaton having the contract for hauling the “Phoenix steamer,” and Mr. Mannegold of the east side had a similar arrangement with the city for hauling the “Pioneer” by the year to fires. About 8 p.m. a fierce fire broke out in a warehouse at the C.&N.W.Ry. depot and spread rapidly. Eaton’s drivers and sons soon had four horses at the house of the “Rotary” and it was not long after they were hooked up that they turned the corner at Main Street, passing the Pioneer, with one team, at the next corner. Charlie Kerr assisted by Bill Ready drove the pole team, while Frank Eaton and Charles Haskell rode the leaders. “Doc” Moore, stoker of the Silsby, fell off at the next crossing and Barney Gardner and his hack cleared the way at the Warren Street corner. He was on his way from the depot and wound up on the sidewalk rather mixed up in Thomas McCabe’s monument display and it has been said that willing hands disconnected the “Bays” and hack and put Barney and his rig on the road again. The fire was of short duration after the Silsby connected to the tank house and the day wound up with a rumpus. Charles Haskell and Charlie Fuermann could not settle the question as to which company had exclusive rights to the water in the tank house without coming to blows and Mr. Haskell got a good one on the top of the head with a spanner, which settled matters until the following day, when one of the east side engine crew called at No. 2 engine house telling the man who was cleaning the Silsby what he would do and proceeded to carry out his threat. The Phoenix boy ran out and rang the bell—the rope then hung outside the north wall; this alarm soon brought a number of firemen, who were employees of Woodard & Stone, on the scene and the intruder was soon out of sight. The officers and engineers of our engine companies in 1877 were John Muth, foreman and chief, F. Bursinger, engineer, E. Kunert, assistant engineer, Charles Fuermann, stoker, Fred Spink, foreman No. 2, C. E. Straw, engineer No. 2, Edwin Moore, assistant engineer, Frank Eaton, stoker. The latter also served as secretary of the Phoenix Company. During the two or three days past the ice packers [harvesters] have been taking as fine, clear and solid ice out of the river as we have ever seen. CONFECTIONARY. Mr. Thomas Moore’s confectionary store is among the best in the State. Everything in the way of toys and candies, nuts and fruit can always be found at his establishment, which has long been the paradise of children. As he does a wholesale as well as retail business, all who wish to buy confectionary by the quantity should purchase from him as he can sell as cheap as anybody and all his articles are the best quality. Pork and Beef Packing Establishment of Joseph Lindon, West Avenue, Watertown, Wis. [today location of public library], has constantly in store and for sale, mess pork, mess beef [barreled cured beef], leaf lard in bbls. and half bbls. [leaf lard has little pork flavor, making it ideal for use in baked goods], bacon (green and smoked), smoked sugar cured hams, smoked sugar cured shoulders, etc., etc., etc., at wholesale and retail. He also keeps a market where can be had at any time at the lowest cash prices the choicest pieces of all kinds of meats, as he takes particular pains to have the best variety constantly on hand. Cash paid for all kinds of stock and produce. C. A. Sprague, Watertown, Wisconsin, wholesale & retail dealer in drugs, medicines, chemicals, paints, oils, glass, varnishes, turpentine, dyestuffs, fancy articles, perfumery, trusses and shoulder braces, pure wines and liquors for medicinal purposes, books, stationary and wall paper. The first matched game of football between the Northwestern University and Sacred Heart College eleven was played yesterday afternoon on the former's campus. Although the weather was extremely cold and a strong northwest wind prevailed, the teams put up a fairly good game and showed numerous strong points in the individual work of the players. As the elevens came on the field it was seen that the Sacred Hearts averaged heavier by several pounds than their opponents . . . The features of the game were the sprinting of Farrell and Quinlen, the tackling of Stuehm, and the work of Krafft and Brand back of the line, although the latter was open to criticism for not better guarding his goal. The time of each half of the game was cut from the customary thirty-five minutes to twenty minutes. The Northwesterns play the Milwaukee Athletic Society eleven tomorrow at Milwaukee. An account of the football game between Northwestern and Sacred Heart. Interesting statements like "it proves that rugby is a manly sport and when played by gentlemen is not so utterly bad after all." Appropriate exercises marked the laying of the cornerstone at the Northwestern University Monday afternoon. Seated on the platform erected for the purpose, near the cornerstone, where the participants in the ceremony, including the visiting clergymen, the trustees, the faculty, the contractors and architects, and the college band. The latter opened the program with music, followed by an oration in English by Rev. Julius Gamm, a professor in the institution. The choir then sang, and Prof. Notz delivered the dedicatory address on behalf of the university. A choral service led by Rev. J. H. Brockmann, of St. Mark’s Church, followed and after that came the laying of the stone. There was a large audience present to witness the ceremonies, and a collection for the benefit of the building fund was taken up. Rev. P. Von Rohn, of Winona, Minn., president of the Wisconsin Lutheran Synod, was among the notables visiting clergy. The cornerstone is placed in the southwest corner of the entirely new addition to the building and is of brown sand stone. It is inscribed with the name of the institution, the date, and the name of the architect, O. C. Uehing. The building is being erected by Duke, Schroeder & Co. of Milwaukee. Work has begun on the new factory of C. May & Sons, located at the foot of Western Avenue, on a lot directly joining their cold storage on the west. The lot was recently purchased by them from the Globe Milling Company and the purchase includes the latter’s old office building. The new structure is to be of stone and brick, one story high, and 36 x 45 feet in size. It will be fitted with the latest improved machinery. Messrs. May & Sons expect to occupy their new quarters by the first of January. C. [Carl?] Stiemke is the contractor. Sixth Lecture. Mr. E. A. Calkins, Editor of the Madison Democrat, has accepted an invitation to deliver the next lecture before the Young Men’s Association and will consequently fulfill his engagement next Monday evening, the 31st inst. His subject is “What we are made for!”—a truly great question, an answer to which has troubled and puzzled mortals through all time. Mr. Calkins is an impressive and pleasing speaker, an able and ready writer, with rare and brilliant imaginative powers, which have enabled him to win an enviable reputation as a poet. He has been long and honorably connected with the press of Wisconsin and ranks among the most talented and accomplished editors in the West. That his lecture will be more than ordinarily attractive and interesting we hazard nothing in saying. We sincerely hope that he will have a large audience, for we are sure that all who attend will be richly compensated for their time. Dedication of St. John’s Church [Jefferson]. On Sunday, the 9th inst., this church was dedicated to the service of Almighty God, with all the rites and pomp peculiar to the Catholic Church by Bishop Henni and Professor De Berge of Milwaukee, assisted by the Rev. F. X. Minderer, the officiating clergymen of the church in presence of a crowded congregation. The altar was tastefully ornamented with several scriptural paintings—one figurative of our Savior’s agony in the garden, beautifully executed. Professor De Berge preached a sermon in the morning, in German, and Bishop Henni followed in English, giving great satisfaction to those present. The services were concluded about two o’clock p.m., when the congregation dispersed. –Jeffersonian [Henni was the bishop of the Milwaukee archdiocese, Father De Berge was a professor at Milwaukee’s Ecclesiastical Seminary and Father Minderer was the parish priest at Jefferson and was later assigned to St. Henry’s, Watertown]. The mildness of the passing season may had led some to suppose that there has been little occasion for the exercise of a discriminating charity in our minds this winter. Such is not entirely the case, for now as ever “The poor we always have with us.” There have been instances of uncomplaining suffering, where a little help kindly extended would have done much to lighten the heavily pressing burden of poverty . . . We have heard of some such cases in this city, and now simply allude to the fact to remind those in whose bosoms the “heavenly flame” of charity yet burns bright and pure, to bear in mind that “God’s Poor” are with us yet and gratitude to Him who may have given us a competence if not an abundance, requires [that] we should share our plenty with those who have nothing. The members of the Young Men’s Association are engaged in an effort to procure the means of making some desirable additions to their library. We are glad to be able to state that so far they have succeeded very well, and in a short time will probably purchase over a hundred dollars worth of new and valuable works, including some of the best and most popular that have been published recently. As this is the only public library in this city, all who can should contribute to this object, and so do something towards placing within reach of the whole community books that many would like to have the privilege of reading, but which would, perhaps, be inaccessible otherwise. In this way, without anyone’s making any great sacrifice, a useful and increasing collection of standard books will gradually be brought together . . . We understand that those who help in raising the fund it is proposed to devote to this purpose will be invited to aid in making out a list of such works as it may be thought best to buy under the circumstances, which course will give all the voice in the matter, and each will be able to a certain extent to have his taste or preference gratified. From beginnings far smaller than this, many extensive libraries have been created. By doing a little every year in this respect, it will not be long before we begin to reap the fruits of our liberality in having conveniently at hand a library to which we can resort for the indulgence of a habit of reading, which may be a source of more pleasure and improvement than almost any other we may form. We are requested to state that next Thursday, the 17th inst., Messrs. F. E. Shandrew, C. A. Sprague and Geo. L. Field, who have been appointed a committee for this purpose, will call at the residences of citizens to ascertain what contributions they are willing to make in books to the Young Men’s Library, a strenuous effort to increase which is now being made. It is thought many would be willing to add some interesting and useful volumes who cannot conveniently, or in justice to themselves, give money. In this way many standard or popular and instructive works may be made to the collection now being gathered together without in the least causing the liberal to make any sacrifice. Let all look over their book shelves and see what volumes they can spare without detriment to themselves and place them where others can have the use of them. By this means parties may accommodate each other and the public generally and not feel any loss. The Planters’ Hotel has recently been overhauled from top to bottom and is now ready for the reception of visitors. It is under the management of its former popular and experienced landlord, Mr. A. F. Cady, who takes not only great pains in giving his old friends and customers a cordial welcome, but will spare no care to make an agreeable and comfortable home for all new ones. We hope “Mine Host” will always have a house full upon whom to bestow his attentions, for he knows how to fill those who place themselves under his care. Resolved, That the Marshal be and he is hereby directed to notify the occupant of the Planter’s Hotel to remove the sign and post recently erected on the northwest corner of said premises, to remove the same within 24 hours after notice shall be given him, and in case of refusal so to do, the Marshal is hereby required to remove the same immediately thereafter. The revival in the Methodist Church still continues with unabated zeal and fervor. We do not like to apply the word excitement to such an awakening of the mind on religious subjects, but the present movement has been productive of much good and some who have not entered the House of Worship for years have become members of a Christian church, and there is no doubt that they will walk in the light which faith sheds on the path way of life. O. B. Sanford & Co.
O. B. Sanford & Co. wants saw logs at their establishment on the east side of Rock River. They wish to purchase a large number and pay the highest cash price. If we should have a run of sleighing, all who have any of the timber for which they advertise in another column, they cannot do better than bring it along and get their money for it. Ours is not a commercial city and we have no ocean or lake coast to give us the trade of a continent or a world. But we have unsurpassed manufacturing facilities, by the improvement of which our place can become populous, wealthy and prosperous. Looking with peculiar favor upon every effort to build up our home interest, we notice with pleasure the new establishment which Sanford & Co. have just put in operation for the manufacture of lumber and flour barrels. It consists of a mill with circular saws, which cuts all kinds of logs into every variety of building material in the shortest space of time, of a stave saw which makes 3,000 staves a day, a heading machine which turns out, all fitted and ready for use, 1,500 barrel heads a day, of a planer of the stave as it is first roughly shaped, and of a jointing machine—in short every necessity to make a good barrel as it exists in the timber until it comes out ready to be packed with the staff of life, to be used at home or sent a thousand miles off to a distant market. This establishment gives steady employment to some fifteen men and consumes annually large quantities of raw material now standing in our forests. It is well organized and everything about it goes on with the regulation of clock work. All the different pieces of machinery are carried by a water power, which, since the completion of the new dam, is reliable and unfailing. A few more such establishments will do a great deal towards increasing the business of our city, furnishing a permanent home, and bringing among us a large number of industrious and intelligent artisans. The enterprising proprietors have taken the right step to advance their own interests and that of the community where they live. Two stave dry houses in the Sixth Ward belonging to Mr. O. B. Sanford, filled with barrel staves, were entirely consumed by fire last evening. There was no insurance on them and their destruction will involve an entire loss of three or four hundred dollars. The fire was accidental and is the more to be regretted as Mr. Sanford was just getting in good working order an establishment for manufacturing a first rate quality of flour barrel staves that promised to be successful and extensive. During the terrific rain and thunderstorm a few nights since a current of lightning struck the chimney tower of O. B. Sanford’s Steam Stave Factory and, without doing much damage, played a good many curious freaks with engine and iron works near by. The price of oysters having declined, Peter Brook & Co. would like to have the lovers of that bivalve understand the fact, as he has a large lot of the best that can be obtained from either New York or Baltimore, at the reduced price. The game season having ended and the time past when a brace of partridges or half dozen quails could be purchased any day in the street, we feel considerable interest in the change. Then again, we suppose, to make up for the loss of birds, every variety of choice fruit, green and dried, can always be found at the well supplied depot on the south side of the bridge, not to mention the confectionary and nuts which Peter always keeps to please his numerous customers, whether old or young. The fact that while everything else is becoming dearer, fresh oysters are becoming cheaper, should largely increase the demand for the latter, and the best and cheapest are always kept at the favorite depot. Fresh shell oysters are already in town and F. P. Brook has them as a matter of course and he is the only dealer in these delicious bivalves of whom they can be had in this city, at the present date. He is ready to serve them up in any way his customers may prefer and that in the finest style which the pleasant art of seeking oysters has yet reached. “Peter” is a careful observer of the seasons and keeps a keen eye on the choice things that belong to each. A splendid array of fruit, the nicest of confectionary, new cider of the most agreeable flavor, and now to crown all, fresh shell oysters to any extent that may be desired. The iron on the Watertown and Madison railroad has been laid to Waterloo and the work of extending it to Hanchetville is going rapidly forward. Construction trains daily pass over the track as far as it is ready, carrying along the line ties, rails and other material necessary to put a road in running order. The completion of this road to the Capitol at no distant day we now regard as certain. From some point near Hanchettville [Marshall] a branch will probably be built to Baraboo Valley, the agricultural resources of which will furnish it with a good paying business. Should the gaps in the Chicago and Fond du Lac road ever be built, it is evident that the tide of travel from the north east portion of the state must be drawn from Milwaukee and pass through our city to the west. This will be an important saving of time, distance in money—points of advantage which no sharp and practical man will ever overlook in estimating the cost of a journey either for pleasure or profit. It will be remembered that Gov. Randall, in his last annual message, suggested the propriety of the citizens of every town in the state organizing societies for the purpose of discussing the thousand questions relating to the best method of cultivating the soil, in having occasional lectures from gentleman of intelligence and experience on grain raising, fruit growing, stock improvement, and the many other topics that might be usefully brought under consideration. The idea, though not new, is a good one and has long been carried in many states with decided success. It is believed that a course of lectures might be secured in almost every farming community, which would be in every way profitable, not only to those whose living and pecuniary prosperity depend upon agricultural knowledge, but to the people generally. Most of these lectures could probably be obtained at little expense, from competent men in the immediate vicinity. But good lectures, even if at considerable expense, would be a profitable investment. Our new ideas of practical importance in regard to manures, or any other of the numerous subjects belonging to agriculture, would pay, in the results of next summer’s labor, for the whole course. The serenaders go the rounds now and then, when the stars are brightest and all the world is silently reposing in the arms of “tired nature’s sweet restorer.” At such an hour, when we least expect it, to be softly awakened out of “balmy sleep” by a “concord of sweet sounds” stealing gently on the ear, is always pleasant and agreeable. We must return our thanks to those who paid us that compliment of a visit the other evening and say to them that long did the tones and words of the beautiful songs with which they came to greet us linger in our ears, after expression had died from the lips that so tunefully warbled them forth. The last month of winter is with us, but as yet we have none of the severe cold both the eastern and western papers talk about. Yesterday and today there have been appearances and attempts at snowing and blowing and freezing, but not much of the reality. Instead of the clear ringing of the merry bells chiming in with the musical voices of some lighthearted and pleasure-going company, we have to put up with the heavy rumble of slowly moving wagons, the owners all wondering when there will be sleighing and winter will begin. The much talked about but rarely seen “six weeks sledding in March” will have to do the thing for us this year. The ice in the river is rapidly dissolving and disappearing. In many places it is gone and the water shimmers and sparkles with a spring-like smile of freedom. There is no snow on the ground. The fields look bare and brown, bereft, as they are, of both the white mantle of winter and the green verdure of summer. If the present warm and sunny weather continues we may expect an early return of buds, leaves and flowers. Winter wheat, we are told by the farmers, has suffered very little from the open and mild winter that is just drawing to a close. There have been better seasons for fall sown grain, but the past has by no means been a bad one. Very little has been damaged or killed and if the spring proves favorable the harvest will be large and ample. The wild ducks are beginning to visit us from the South. In the absence of other game they afford fine sport for the hunter and are now in the best condition for the table. When they first reach us in the spring they are generally plump and full, having found plenty to eat in the bays and rivers which they frequent in the South. If you would have a sleigh ride you must go while the snow lasts. Feeling the full force of this truth and observing that the little snow on the ground was likely to go off as soon as it came, a universal determination was formed by a large number of our citizens to make good use of it while it remained. Accordingly, last Monday afternoon there was a general sleigh ride. All went who could find, hire, borrow, hook or steal a team. The first we knew of the movement was to find a neat cutter and fine horse standing in front of our door, from W. H. Humphrey’s extensive and well furnished livery establishment, with an invitation to sport with the crowd. So to the ride we went with the long procession of the gayest and best turnouts the city affords and over the long, smooth, prairie-like road, which was in the best condition, we dashed and played to our hearts content. There must have been sixty or seventy teams flying and running in all directions over the level surface that furnished so good a field for the display of horsemanship. The music of the jingling bells, the excitement of the occasional race, the ring of merry voices, the smiles on happy faces, all combined to make the affair pleasant and delightful, and none the less so because in some respects it was a surprise party. This was the first chance for anything like an old fashioned sleigh ride that has presented itself so far this winter and according to present appearances will be the last, for the snow has nearly all disappeared in the April-like warmth and sunshine which makes all seem and look so spring-like and bright. A gleam of sunshine—the display of desire to do a good thing—now and then breaks through the heavy mass of the dreary proceedings of Congress and seems to indicate that the more popular branch of the national legislature does not consider itself entirely above consulting the wishes of the people, whose voice is always entitled to a respectable hearing. On the 1st of the present month, the House of Representatives passed a HOMESTEAD BILL by a vote of 128 to 76, giving to the head of every family who is a citizen of the United States or has declared his intentions to become such, one hundred and sixty acres of unappropriated lands belonging to the general government. The favorable action of the Senate and the signature of the President are all that is necessary to make the just and beneficent principle, on which the proposed act is based, the settled policy of the nation, so far as the future disposal of our vast public domains is concerned. [Areas] broad and rich enough for the organization of many great flourishing states, within the ample limits of some of which the first pioneer has yet to make his appearance and build his hut, hundreds of miles, it may be, away from the nearest settlement, and there in patience and solitude, await the approach of civilization. If he is yet a young man, it is more than probable that before he has passed much beyond mid-life, he will have neighbors with whom to exchange the hospitalities of society, schools in which to educate his children, churches in which to worship, journals from which to read the latest news, railroads over which to travel, a government to protect his life, name and property . . . Clothes stealing is a business that is carried on to a considerable extent in this city just now. Two or three instances have recently occurred where families have been robbed of nearly a whole washing at a time, the clothes having been left on the line through the evening. That this, like most other cities, is infested with gangs who make it a business to engage in the meanest of all kinds of plunder, is pretty certain, or there would not be so much complaint of losses of this kind. We allude to these incidents for the purpose of setting those on their guard who may not be aware of the danger they run leaving their clothes exposed. To the Electors of the City of Watertown. The undersigned would respectfully announce to the citizens of Watertown that, at the solicitations of his friends, he will be a candidate for the office of City Treasurer at the coming municipal election. Should he be elected he will devote his time and attention to the discharge of his duties as a public officer and endeavor to meet the approval of the public by the promptness and punctuality with which he will meet every obligation that will then devolve upon him. The friends of Mayor Bertram—a gentleman who has faithfully served the public in various capacities during the last four years—should remember his claims to their active efforts [at the election] next Tuesday and give him a practical demonstration of their regard for him. The office of City Treasurer is really as important as any municipal position known to our charter. We strongly approve of the plan of volunteer candidates for most places filled by the people at their spring elections. When this course in pursued we are more likely to have a larger choice of capable men. Henry Graves will be one of those to propose to run for this office next April. He is well qualified to correctly discharge all its duties—being an experienced, careful and prompt business man. He would make a good officer and give no occasion for the people to regret his election. I see Mr. Lincoln has made up his Cabinet and I am not there. I am now prepared to say I would take some place in the gift of our citizens, at their next charter election, should they think me worthy and qualified—say—City Treasurer. H. Graves, Watertown. Resolved, That a committee be appointed to confer with Messrs. Bieber & Co. and ascertain the amount of rent for “lock up” for the ensuring year and also what repairs, if any, may be needed to the same. Resolved, That the City Clerk is hereby authorized and required to cancel the contract entered into by P. B. Basford with the City of Watertown for the erection of two Public School Houses, and deliver to him his bond on file as surety for the erection of the same. Resolved, That the Treasurer be authorized to call upon John Luber, Esq., late City Treasurer, to pay into the Treasury the sum of seven dollars, not paid over by him to his successor in office as required by law, which seven dollars was paid him as Treasurer by Daniel Hall, Esq., and in case of the refusal of said Luber to pay the same, the Treasurer is authorized to sue said Luber and his surety for the amount, immediately after said refusal. The German Rifle Company [assumed to be same as Watertown Rifle Co] came out on the 22d of February in commemoration of Washington’s birthday. They, if nobody else, were mindful of the day that gave birth to the noblest champion freedom ever had. “What are you going to parade today for?” said a Yankee to a Dutchman, as the latter went along the street dressed in the uniform of his company. “That is a question no countryman of Washington ought to ask,” was the quick and slightly sarcastic reply. Mr. D. Wing, who is just bringing to a close a course of lessons in fancy dancing, is now giving a series of cotillion parties on Friday evenings at the close of the regular exercises, which are very pleasant and delightful. Though not intended to be public yet the parents of scholars and those receiving cards are invited to be present and join in the amusements of the occasion. As all know who have been under his instruction, Mr. Wing is a successful and accomplished teacher in the art of dancing and we hope his parties will be fully attended. The cost to those going will only be trifling, just enough to defray the expenses of music, lights and room, while the real enjoyment may be much more than that experienced at larger and more formal assemblages. The season that reminds us of bright, clear, pleasant days intervening between cool frosty mornings and evenings, must be nearby or is even now upon us, judging from the mild weather we are having. Some farmers have already tapped their trees and if the spring is favorable there will be a pretty large amount manufactured. As an article of commerce there is usually a ready sale for maple sugar at paying prices. Those who have the groves and the means will do well to make the most of them. A trip to Pike’s Peak is now the general talk among a considerable number of our citizens. Our hearty wish is for their success, and if a word from us could give it to them, they should all have it beyond their fondest expectations—gold plenty, romance and contentment should be theirs in the fullest measure. But after reading all the accounts we could find relative to the auriferous [yielding or containing gold] wealth of that region, we have not been able to resist the conclusion that the element of humbug largely mingles in the excitement. Those out of employment—who have nothing else to do and cannot lose anything in the event, whether they find gold dust or sand, and are in want of a little variety, adventure and experience, if they have got the fever—had better go. For those who are doing well it will be at the very least a hazardous enterprise and, in too many instances, a fatal undertaking. Some may go with nothing and return with much—others will go with much and return with nothing. If an election should take place and the parties are divided into these two classes, the latter would have an overwhelming majority and sweep all before them. Emigration to Pike’s Peak has commenced. Wet weather and bad roads do not seem to have the least tendency to damp the ardor or confidence of the adventurers. Some five companies, with all the necessary outfits, have left our city within the past few days and more are getting ready to start. Every day more or less covered wagons pass through our streets on the way to the region of gold, whose soil is said to be profusely mingled with glittering dust. Men of all classes, conditions and occupations—capitalists and laborers, gentlemen and loafers, lawyers and scoundrels, mechanics and thieves, editors and liars, doctors and assassins, ministers and hypocrites, merchants and swindlers, bankers and gamblers, shavers and cut-throats, those who live by their labors and those who exist by their wits—will be thrown together in the strangely mixed and confused community which is about to assemble in the shadows, in the valleys and along the streams of the Rocky Mountains . . . Our city is losing, for a time at least, some of its highly respected and enterprising residents. We hope some of them find fortunes and return. Others will depart whom, with some misgivings, we commend the tender mercies of the grizzly bears and wolves and hope the morals of the latter will not suffer by the contact. To the Editor of the Watertown Democrat: [from Pike’s Peak] I promised my friends I wou’d write them something reliable and as my acquaintances in your secshum (it is all suction this way and the worst kind too) of the country are very numerous, I must ask you to publish this letter . . . Jim (that’s my wife’s brother) has got more gold than I have, but the chunks aint as big, the largest aint bigger than your fist. You see I went in for big lumps, cause they are easier to lode and if he hadn’t rigged his cart so it wou’d dump I woul’d beat him. He always was the darndest fellow on inventions; he invented a perpetual motion whiskey fount . . . but to business: when we had bin tu work mor’n ten days or two weeks we struck shot gold; the chunks vary in size from a pigeon shot to a cannon ball; the heavy ones we put into the bin and we keep the small ones to shoot rabbits with; the rabbits here have the darndest longest ears you ever did see . . . Excuse haste and a bad pen. Yours in the cause of freedom and philanthropy, A. Jackson Dolbeater. An Ex-Mayor of Nebraska City, who has been to Pike’s Peak and “seen the Elephant”—he finds the animal one of huge proportions—writes in language more plain than classic, as follows: “My impression of the mines is that they are a d----d humbug. I wish I could write otherwise and particularly on my own account.” Some of the Watertown boys had better put that in their pipes and smoke it and see whether it has the genuine flavor. The tide of emigration to Pike’s Peak has set in with full force. Every day trains of wagons, loaded with every mentionable variety of utensils and instruments of work, pass through our streets. Today as fine a lot of fellows left our city as can be found on the road to the land of promise and gold, viz: Stephen Stimpson, Jesse Moulton, E. C. Tompkins, Dr. G. Shamberg, and George Breckenridge. On the Tuesday previous N. Nettleton, Charles Gilman, Edward Gilman, H. Moak, R. B. Bassford, Thomas Spencer and some others, whose names we do not now remember, took their departure. We sincerely hope they will all return to wife, children and friends—those of them who possess these transcendent blessings—with all their high expectations fully realized. Messrs. Edward and Charles Gilman of this city returned home last week from the Rocky Mountain gold diggings. They bring favorable returns as to the facilities that far off region offers for making money. The Watertown boys, of whom there is quite a delegation at Denver City and in the mines, are reported as doing well, and some of them as accumulating the “filthy lucre” faster than they can spend it. We are glad to hear of their prosperity and hope that fortune will continue to favor them until they shall have made their “pile.” Messrs. Gillman give rather a discouraging account of the enjoyments attending one’s life there, but they are none the less agreeable than we have been led heretofore to regard them by statements from others who have been there and seen the elephant in all his different aspects. That country after all is one where there undoubtedly is as much shade as sunshine, and in which adversity quite as much as prosperity is the net result of months and months of earnest and industrious toil. We understand it is the intention of the Messrs. Gillman to return there in February. Dr. Shamberg, who has been a resident of this city during the past year and within that time gained a wide reputation as a skillful and practical operator of dentistry, left this city this morning to be absent a few months, during which time Dr. William Potter of Fond du Lac, who has justly gained as favorable a reputation in his profession in that city, is prepared to attend to the wants of all who may require the services of a practical dentist. Dr. S. intends to return home early in the fall and resume his professional labors. Got Back—Dr. G. Shamburg and Calvin Cheney—two Pike’s Peak adventurers from this city—have returned to their homes. We believe neither of them have actually been to the mountains, but both have seen gold that has been taken from them. They freely tell what they have heard and observed—cheerfully give others the benefit of their experience—but when we get down to elements of what they have really found out from actual examination in the mines themselves, it amounts to just about as much as the observation of hundreds of others who have been very near the auriferous ranges, but never reached them quite—that is nothing very definite, nothing very certain, nothing very encouraging—only they would advise others to keep away. Good, bad, indifferent, doubtful, and slightly on the fence. Dr. G. Shamberg, the accomplished dentist of this city, has got over his Pike’s Peak and Rocky Mountain wanderings for the present and resumed the practice of his profession in our midst. He is a practical operator of unerring skill, though he doesn’t like the way we welcomed him back from the plains a few weeks since. He says we told one story about his adventures, while he was all the time telling another. We, if we misrepresented him, we are sorry for it, but whether or not he knows how to dig gold out of the leads in the rocks, he knows how to deposit it in the cavities of the teeth so that it will stay there, and it is an admirable thing to be a perfect master of at least one useful art. Another party, consisting of Hon. L. A. Cole, Amos Steck, David Montgomery, Calvin Cheney, Dr. Anthony Lee, Charles Fobes, Hopewell Fobes, Benjamin Fobes and E. G. Cole, left this city for Pike’s Peak last Tuesday morning. The names of some of this company have long been familiar to this community and prominent among our business firms. Of course they carry with them, in their new and somewhat hazardous adventure, the best wishes of all for their complete success. As we should regret to learn that we are to lose them as residents of our city, we certainly hope they will return at no distant day with all their expectations fully realized. They are going to a new or at least unsettled country, supposed to be rich in gold, if not fertile in soil, where everything is yet to be done and the ragged features of nature softened and beautified by the hand of civilization. If nothing else is done, the elements of another State may be collected together on the eastern slopes of the great mountain chain, and that will be something—enough to reward all for sacrifices it will cost. The German party, consisting of John Riedenger, John Luber, Gottlieb Baumann and three others, whose names we do not now remember, which left this city for Pike’s Peak about seven weeks ago, returned home last Saturday. After getting six miles beyond Big Blue River, they came to the conclusion that it would be folly to go on and abandoned the expedition, as they had the most satisfactory evidence that the further they went the worse off they would be. They continually met companies who were returning from the mines, and at the point at which they stopped, they encountered over fifty teams coming back. Those who reached the supposed gold regions and made a fair trial were decided and unanimous in their condemnation of the whole thing as a swindle, got up to dupe the country, and in this respect it was a brilliant success. The most any diggers have been known to make was from forty to fifty cents a day. The gold is there but so far as getting it is concerned more can be obtained with the spade, the plow and the tool any where else than out there, and with much less labor and far greater ease. Another of the adventurers who left here this spring for Pike’s Peak—R. B. Basford—returned a few days since and in common with the rest of the boys who “marched up the hill and then marched down again,” seems to be perfectly satisfied with the view he had of the elephant. He says a trip with an ox team as far as the Big Blue, which is the point he had reached when he determined to turn back, give a person a pretty correct idea of the entire animal. Some others who left here are coming back, while three or four whose faith is strong in the richness of the mines and the practicability of getting at it have gone on, though we believe at one time they also faltered and had traveled some twenty five or thirty miles on their return route. The city of Watertown is likely to have its full share of representatives in the Rocky Mountain gold regions. Already several parties have taken their departure, and others are preparing to follow. Last week a company comprised of T. M. Smith and John Martin of this city, and E. C. Tompkins, Dr. and William Davis of Fond du Lac, left for the extensive fields west. Last Monday Edward Gilman, an old and well known citizen, also set out on the same expedition. We hope they will all have a pleasant journey, get what they travel so far to find, and safely return richer, wiser and happier men. A party consisting of R. S. Little, Hanford Reed and family, Harris Gilman and Hiram S. Hughs left this city last week for the Pike’s Peak gold regions. They took with them their own conveyances, together with the necessary implements for working the mines. They are all well known and estimable citizens. We hope they will have the good fortune to strike rich and paying leads, make money as fast as they desire, and eventually return with their expectations fully gratified. The emigration to the country beyond the Mississippi will be immense this season. Many thousands are now wending their way to the fair fields and valleys of the west—some to engage in agricultural pursuits and make permanent homes, and others to try the more doubtful but tempting business of mining for the gold that is now known to be plentifully scattered throughout the rocky veins of the mountains and along the channels of the streams. Wisconsin has contributed her share to the number of those who will win or lose by taking their chances in these adventures. We shall all wait with interest to learn how these numerous expeditions will turn out and be glad to hear that they are well planned and successful. Donation visit. The friends—they are many—of Rev. L. W. Russ [pastor of St. Paul’s Episcopal], will pay him a Donation Visit at his residence next Tuesday evening, 22d. Let the attendance be large—the contributions liberal—and the willing spirit in which all is done, lend additional grace and give a higher value to every gift laid on the altar around which we all reverently bow when the heart feels most deeply its debt of gratitude for the promise of immortality that brightly beams through its loftiest hopes or darkest sorrows. In this free and happy land there is no union of Church and State. The spread of the Gospel depends upon the voluntary bounty of the people. Not only angel-minded charity but even-handed justice to those who devote their lives to the service of not only the Great but the Divine Teacher . . . We should ever extend to preachers of the faith all the aid necessary to make their self-sacrificing labors successful as it is [in]the interests of mankind [that] their efforts should be . . . His wants are as numerous and urgent as our own can be. The Jeffersonian calls for more direct mail service between this city and that village and very justly too. We ought to have it and there is no good reason why we should not. We copy below its article on this subject and commend it to the attention of our vigilant Post Master. We would state for the information of our contemporary that the Democrat is almost always mailed on Wednesday. Though the Jeffersonian is published on Thursday we never get it before Saturday and frequently not till Monday following. Area residents will have the opportunity to view the Milwaukee Regional Medical Center's new emergency helicopter at 8 a.m. Tuesday at Watertown Memorial Hospital. The “Flight for Life” unit is the first based emergency helicopter service in Wisconsin and will be ready to serve the Watertown area late next month or in early February. The helicopter is equipped similarly to a paramedic unit. The equipment includes a ventilator, cardiac monitor and defibrillator, intubation and airway supplies, MAST pants, splints, and other emergency equipment and supplies. Curtis J. Kleppin, a 14-year veteran of the Watertown Police Department, has been promoted from sergeant to captain. Kleppin began his career with the Watertown Police Department on Oct. 5, 1994. During his tenure with the city department, Kleppin has served as a field training officer, detective and in various capacities as a sergeant. He is currently a certified instructor in defense and arrest tactics and electronic control devices. In June of 1999, Kleppin was awarded the department's lifesaving award for assisting in saving the life of a man who was intent on committing suicide. For his actions, he and three other officers were chosen as Jefferson County Law Enforcement Officers of the Year. Kleppin is a graduate of Hartford Union High School and earned a bachelor's degree from the University of Wisconsin-Milwaukee in Criminal Justice and Sociology in 1993. He obtained a master's degree in the Science of Management from Cardinal Stritch College in 2006. Plant and city officials broke ground Friday for a new warehouse at U.S. Chemical Corporation, 316 Hart Street. The firm will erect a 200 by 150 foot warehouse to the north and west of its present plant. The new warehouse, President Noel Schomburg said, will allow room for a new laboratory in the present facility. The lab will be the principal corporate lab for Hydrite Chemical Company, which owns U.S. Chemical and a half dozen other chemical companies in Wisconsin and the Midwest. Schomburg said that the present expansion, which will cost about $1 million, also paves the way for future expansion by Hydrite at the Watertown facility. U.S. Chemical Corp., a division of Hydrite Chemical Co., has been sold to SC Johnson Professional of Racine. The companies announced the signing of a letter of intent for the sale this week. The legal closing is expected to take place June 26 following government regulatory approvals and execution of a definitive agreement. U.S. Chemical, headquartered in Brookfield, has manufacturing operations in Watertown and warehousing in Watertown and Stockton, Calif.
Nearly 55 years after his plane was shot down in World War II, Ray Kubly is still serving his country and the U.S. Air Force. Last week, Kubly agreed to share information about his escape from the German army with Air Force's Joint Services Survival, Evasion, Resistance and Escape Agency. The agency is conducting an oral history research project for people who were able to escape captivity. Kubly, a Watertown native, was one of the people called to provide insight. “I'm happy to say that I'm still here and able to help the Air Force and our country,” said the 74-year-old Kubly. The German 48'ers brought genial qualities which found expression in social gatherings. Sunday afternoons at the William Tell House, operated by the Banmann's, near what is now Maple Park, were events where everybody met everybody else regularly, the whole family appearing; the men passed the time in bowling, the ladies compared recipes, and methods of housekeeping over coffee, the children were on merry-go-rounds, swings, etc. Everybody walked, the whole family starting out soon after dinner; on the way every garden en route was admired — exchanges of seeds were made or arranged for; carefully labeled, they bore not only the name of the flower but also of the donor, and after a bit of special advice or interest. On the east side were the Hermann's Garden (present Kresenski-Stabenfeld sites), and the Ulrich Habheggar place just north of N. Fourth Street bridge. Mrs. Hermann was famous as a fine baker and confectioner—coffee at Hermann's was the superlative degree of the ladies' happiness—here was born the German club "Die olle Kamillen," by Fritz Reuter admirers, a long time a most enjoyable affair of best things. The Ulrich Habhegger place had the advantage of beautiful scenery both up and down stream. Here was built a pavilion, one end extending to an arbor, overrun by vines, and containing tables and benches where one could be served; the eastern extension was a bowling alley patronized so extensively that reservations had to be made, and clubs formed. Boats plied from landings, swimming was enjoyed; in winter there was skating, the Habhegger, Hermann and Racek children easily holding the championships to the envy of all others not so favorably situated in the sites of their homes. Washington Park is a part of "Richard's Grove," the picnic place of early days, where the first "school children's picnic" was held, a nice, clean grove, within walking distance. Prochazka's Place (present Green Bowl Tea), home of Wenzel and Anton Prochazka, was generously offered to any one capable of appreciation, by the owners, who for many years furnished Watertown with the best radishes, onions, celery, etc. People, brought their baskets to stay all day, Mrs. Prochazka offering her kitchen to prepare coffee, and, though a very busy woman, never so happy as when she could add something "from the house" to perfect matters. The picturesque willows, with seats in them, the blue skies, the winding river, the lovely flower-garden stretches, with birds and butterflies, made an ideal spot to come to with a book, all was conducive to best things. In the 7th Ward the Boing Home (now Steinhorst's Place) was the mecca of visitors on Sunday — the host and hostess always had the latch out, and a welcome awaited all who visited here. Here, too, bowling might be indulged in. Everybody was a hiker—Luber's Hill, Luke's Hill, Indian Hill, Oak Hill, Sugar Island, Mud Tavern, etc., etc., were landmarks. Eggs and butter carried all the way from Old Lebanon, brought 8 cents and 11 cents respectively. 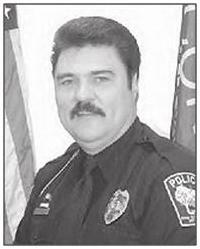 Officer Mike Kumbier, affectionately dubbed “The Elvis Cop,” will be retiring. Kumbier’s appearance, which includes black hair trained in an Elvis-style pompadour and pork chop sideburns, has led more than one motorist to do a double take. A 1977 graduate of Watertown High School, Kumbier began his career with the Watertown Police Department on June 14, 1982, after serving in the United Stated Marine Corps. During his almost three decades with the department, Kumbier worked each of the three shifts and served a four-year tour as a police school resource officer. He also served the department as a state certified emergency vehicle operation instructor. On Oct. 14, 1997, he was awarded the department’s Life Saving Award for saving the life of an elderly man by using CPR. During the course of his career, Kumbier received 10 letters of commendation for meritorious service to the citizens of Watertown. The Watertown Daily Times is now offering a full electronic edition, in addition to the regular print edition. A full copy of each edition will be available on a subscription basis by going to the Times' Web site at www.wdtimes.com. The pages will be seen exactly as they appear in the print edition, and individual stories can be clicked on to make the print larger or smaller as needed. To introduce the full electronic edition, the Web site will be free of charge from today through the Jan. 24 edition. After that time, the electronic edition will be available on a subscription basis. As an added feature, the electronic Web site will offer archive subscriptions which will allow the subscriber to go back in past issues, dating back to 2005. Mr. Edward F. Behling a well known Watertown traveling man died at his home in that city last Friday, Feb. 5, 1915, at the age of 37 years. He was one of Watertown’s most popular citizens, and was employed as a salesman for the Hansen Glove Company, Milwaukee. His funeral services were held Wednesday at St. John’s Lutheran Church, Watertown. Mr. Reinhold Jaeger, a Watertown boy, died at the home of his parents Mr. and Mrs. August Jaeger last Wednesday morning, at the age of 20 years and 10 months. The young man was a printer by trade. Turner Hall held its annual Christmas party for its members and wives recently in its renovated Turners Pub Room on the second floor. According to Henry Schaller, Turner publicity director, members of the organization have been reconstructing the room for more than a year. “By summing it up,” said Schaller. “It was a vast transformation or face lift of the entire upper wing of the second floor.” The men's meeting room and auxiliary meeting room were renovated for the new facility. The meeting room has been entirely redecorated, said Schaller. The H rate makeup stamp is hard to find. Post offices in Watertown and Ixonia were out of the 1-cent stamp issued by the U. S. Post Office as of this morning. The stamp became a hot item last week already as customers prepared for the increased cost for first-class letters. The rate increase took effect Sunday. Who is in that tree? Who are those faces looking at me? “I really don't know, but that's how they turned out,” said Kyran Clark, who carved the figures in a tree stump outside Marquardt Memorial Manor on Hill Street. “In the back of my mind, they could represent George Marquardt, patriarch of this place, and his daughter Anna. Or it could be his wife Marie,” he said, referring to the man and woman's faces outlined on the outside of the tree. The evolution of the ugly stump into an objet d'art has garnered a number of toots and thumbs-up as motorists slow down to gawk. A definite offer of fifty cent for every dollar donated by the citizens of Dodge and Jefferson Counties for St. Mary’s Hospital, is made by the Sisters of the charge of the institution, i.e., if the citizens give $50,000, the Sisters will put in $25,000 more; if the public contributes $75,000, the Sisters will add $37,500 to this sum, and so on. Thus the additional sum offered is a gift larger than that made by Mr. Carnegie to the Public Library of Watertown. To secure this munificent donation NOW is the time to act, and every public spirited citizen should step to the front and help build a hospital that will be big enough and so completely equipped, that all who apply for admittance or treatment will find a place. You do not know when you or yours may need the care only to be had in a hospital; be wise enough to provide for this haven of refuge NOW when it is offered to you on such gift terms. Time is a relentless master, and will demand an accounting for the many good things he has given you. Can you show a credit big enough to satisfy your idea of charity? This is your opportunity to put your money in a place where it will do much good; you cannot take it with you when you die. Every day you see legal and family squabbles over money left by men who knew better how it should have been applied, than the use which is now being made of it by their heirs. If these men had only administered a part of their estate, with the same good sense and wisdom they used in accumulating their money, they would have done much good for their fellowmen; instead of leaving a heritage of rancor, jealousy and ill-feeling to their heirs. A few thousand planted in a public charity like the hospital would have prepared the way for many grateful thoughts sent back to the benefactor by the sick who had a place in the good will of the donor. Habit keeps us blind as a bat: We go over a certain path every day but do not see the many opportunities for pleasure, comfort, or even money-making, when these are pointed out to the plodding man he is astonished at the many things he has missed in his daily life. For some weeks we have been trying to tell you where there is a source of pleasure you have never thought of before: It is the happiness of GIVING and that to a most worthy object, the new St. Mary’s Hospital at Watertown. In all probability almost every person will at some time in the future need the services of a hospital; particularly those who are growing old, and like life insurance it is well to make provision for an emergency before it arises. When the time comes, the need will confront you so quickly and suddenly: accident and sickness do not give warning that you make preparation at the last minute. For this reason bury all objections of every sort and kind, and only consider the service a hospital will render you when it is required. This is no theory, this is a FACT which everybody will do well to recognize. The necessity will arise suddenly and those who live out of the city will need the services of a hospital more, or equally, with those who live in the city: because in the country the houses are far removed from a doctor, a drug store or even a grocery store where the little luxuries can be quickly had. Another feature: the home offers meager facilities for taking care of the patient, but when he is in the hospital he will have everything he ought to have, including the luxuries. The mails have carried a large number of invitations to many persons to contribute to this fund, some of which have been answered. If you live in the city do not wait for the solicitor to call on you. If you live in the country, send your donation by mail, or call in person at the Headquarters, 11 Main Street, Watertown, Wisconsin, where it will at once be announced to all the workers: thus stimulating them to renewed efforts. There is considerably talk in some quarters of having President A. F. Ernst of the Northwestern University for the Democratic candidate for governor this fall. In a long list of preferences of Juneau Democrats for governor published in last week’s Independent, Prof. Ernst is favored by a goodly number. But we doubt whether the reverend professor would consent to entering politics to such an extent as these supporters desire. The annual meeting of the Wisconsin State Temperance Society will be held in the city of Madison on Wednesday, the 9th day of March, at 11 o’clock a.m. The pressing necessities of the Temperance cause in the State at this time calls for a vigorous effort on the part of its friends to stay the progress of vice and to awaken deeper and more earnest convictions among the people as to the true character of intemperance and the necessity for the use of more efficient remedies. It is to be hoped that the friends to temperance from all parts of the State will attend this meeting and contribute their counsels and sympathies anew to the cause. Other States are moving with renewed vigor in the right direction and the friends of reform in our beautiful State should in no way be indifferent to the claims of humanity upon us. S. M. Hewlett, the distinguished and talented Temperance Lecturer, gave us a call last Monday. He has just returned from an extensive and successful southern tour, having visited Kentucky, Tennessee, Louisiana, Mississippi and Alabama, and addressed many and crowded houses in each of those states. Almost everywhere he has met with the kindest reception among the friends of the great and beneficent cause he so ably and sincerely advocates, and but for the wholly unprovoked misrepresentations of some northern journals, would have had nothing to mar the pleasure of his journey . . . As a lecturer he glides from grave to gay, from lively to severe, with wonderful ease and rapidity—one moment holding the rapt attention of thousands by some thrilling appeal or touching narrative—the next convulsing all with roars of laughter—now lighting up a deep argument with a bright flash of wit, then illustrating an important truth with an admirably told anecdote that contains a lesson as well as a joke. We hope he may be induced to speak in this city during his stay in our midst. The Watertown Women's Center this week played host to one of its own, the Rev. Gwen Sayler, who helped found the center more than 10 years ago. Sayler, who now lives and teaches in Iowa, brought a dozen of her students to Watertown to explore how such a center can be created and sustained in a community. Through a round table discussion and tour of the center, current residents active at the center were happy to share its successes. McDonald's, 625 S. Church St., was declared a total loss after a two-alarm fire burned through the roof of the restaurant Tuesday night. The Watertown Police Department has determined from information provided by witnesses and fire personnel that the fire was caused by a malfunctioning piece of heating, ventilating and air conditioning equipment on the roof of the building. 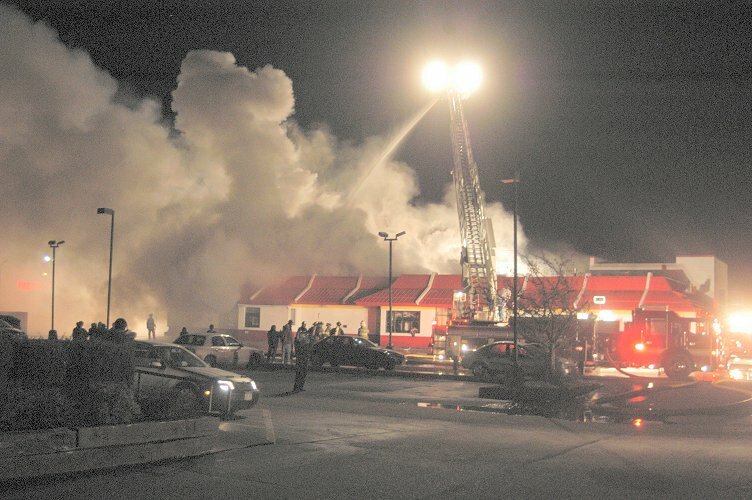 According to Watertown fire Chief Henry Butts, the Watertown Fire Department received a call for the structure fire Tuesday at 6:11 p.m. and when firefighters first arrived at the scene heavy smoke was pouring out of the roof on the east side of the building near the drive-through. For the first time since it was implemented on Sept. 1, the Watertown Fire Department used the Mutual Aid Box Alarm System and Butts said he could not have been more pleased with the results. The Mutual Aid Box Alarm System is a coordinated effort that helps reduce the amount of time it takes to get needed equipment to the scene of an emergency. “Instead of having to tell the dispatchers call this fire department and ask for this, call this fire department and ask for that and call this fire department and ask for that, all I had to do was say call Dodge and Jefferson County and strike the second alarm for a fire at this address and it was done,” Butts said. “I talked with the dispatchers on duty after the fire and they said they were able to get the extra equipment on the road quicker by using this system, so I am very pleased with that,” he added. A McDonald's employee was injured and taken to Watertown Medical Regional Center, but the injury was not directly related to the fire. The person had a medical condition which was exasperated by the fire. No firefighters were injured. City assessor Tom Brandt said the McDonald's building was valued at approximately $630,000. The equipment inside the structure was estimated at about $146,000, Brandt added. According to the city's Building, Safety and Zoning office, the first building permit issued to McDonald's was in April of 1975. The owner of the building was Franchise Realty Interstate Corp. of Waukesha.